It was a real pleasure to meet you and your band members. You stole the show with a magnificent performance, superb! From all at LHG, behind the scenes we thank you also. We will be in touch with regards to a further potential event later. Thank you again! Sue and I cannot praise you and your wonderful swing band enough. 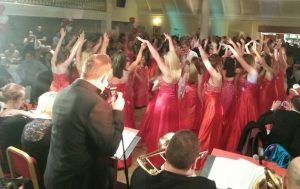 We have organised many prestigious balls and dinner dances over the years and we have hired some of the finest dance bands in the country but we can truly say that Mr Swing’s Dance Orchestra is the best we have ever used. It was absolutely magical, thank you. We are so so overwhelmed with gratitude to you for the evening because you absolutely made it. We would recommend you to anyone in the World; we already have a few people in mind. 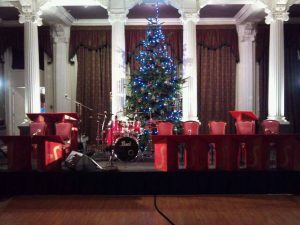 Comments from the guests included “The best band I have ever heard” and “What a fabulous band!” Not only were the musicians excellent but more importantly they all enjoyed playing which made for a wonderfully warm and welcoming atmosphere. It was a pleasure meeting you Matthew and a privilege to listen to your wonderful band which helped to make the evening very special indeed. Just about to embark on our honeymoon cruise but wanted to say a huge thank you for playing at our wedding at Crathorne Hall on Friday. We had a wonderful day in which you played a huge part. Everyone loved the music and even the hotel staff said you were the best band they had had play there in the past few years!!! The whole day was fantastic but the culmination with your orchestra absolutely topped off the day – FABULOUS. STUNNING!!!!! 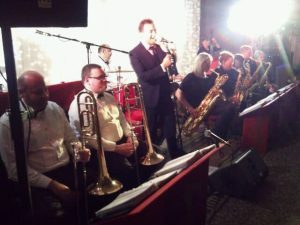 It had been a fair few years since Mr Swing last played at Carlton Towers and oh how we’ve missed it! An amazing gothic hall set in sprawling countryside and owned by the Duke of Norfolk, Carlton Towers offers splendour on a grand scale. 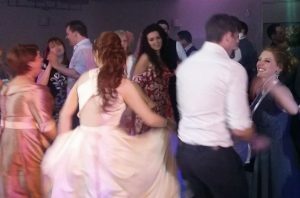 Sam and Joe had chosen ‘When I Fall In Love’ for their first dance and soon family and friends joined them on the dancefloor where they remained throughout the evening. It really was a great night! Mr Swing’s Dance Orchestra had played at Louisa Riddell’s wedding well over a decade ago and were very pleased to be invited once more by this lovely family to perform at this evening of celebration. With various members enjoying milestone anniversaries and birthdays in the same year, the family had decided to throw one big shindig! keep the dance-floor full well into the small hours, a great night was had by all. Never a band to resist a photo opportunity, we all crammed into this shot in the photo mirror provided by Club Class Entertainment. Liverpool’s wonderful Pier Head area had been invaded by many beautiful tall ships for a weekend full of events. There were five performance stages with the main one outside the Cunard building. Dr Jazz entertained a large crowd in the afternoon sun before Mr Swing’s Dance Orchestra played a 75-minute set later in the evening. Mr Swing’s set list contained many sing-a-long favourites and the crowd duly obliged. Never before in Mr Swing’s 21-year history has the band played for such wonderful hosts. Sue and Malcolm Humpage had organised a weekend of events for former pupils and staff of the school and had invited Mr Swing’s Dance Orchestra to entertain at the showpiece gala dinner. We took to the stage after some emotive speeches and received some lovely comments from guests following our performance. What an honour! WHAT. AN. HONOUR! 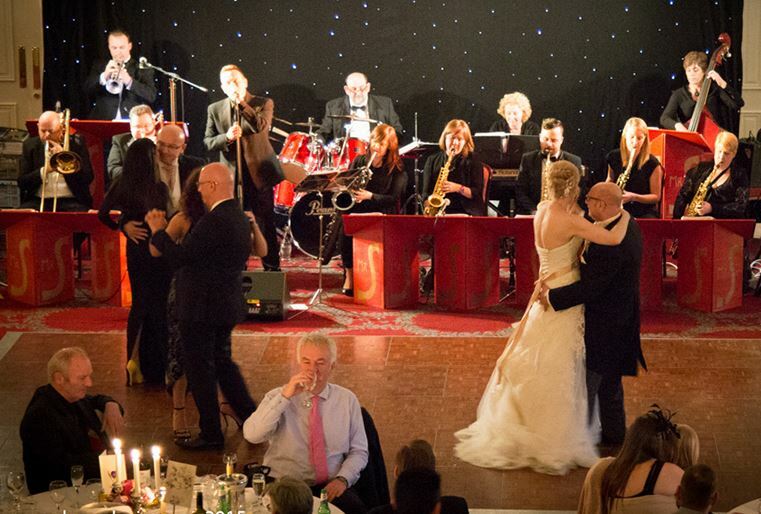 Lexi Hambro, the event organiser, had booked Mr Swing’s Dance Orchestra for her wedding a few years ago and thought the band would be perfect to get party-goers up on their feet at this very special event in one of the country’s most iconic venues. With photographs of Marilyn Monroe, Sir Laurence Olivier, Albert Einstein, George Bernard Shaw and The Rolling Stones attending events in the ballroom adorning the walls, we felt very humble to be performing in the same historic room. 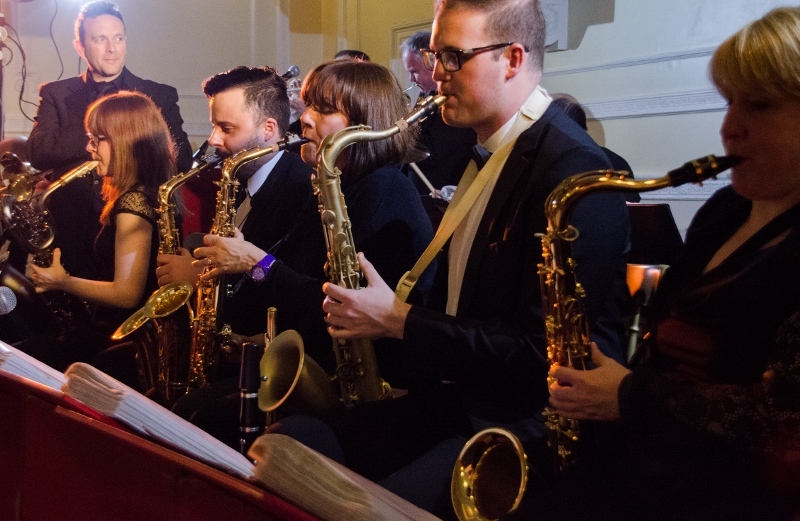 The evening itself raised tens of thousands for the Make A Wish Foundation and Mr Swing’s Dance Orchestra was one of many acts to entertain London’s elite, rounding off the night to a packed dance-floor. 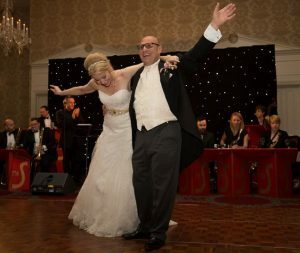 Having not played at Crathorne Hall for years, Mr Swing’s Dance Orchestra finds itself booked for two weddings there within a few weeks of each other. The first is for Angela and David, a lovely couple from the north east. 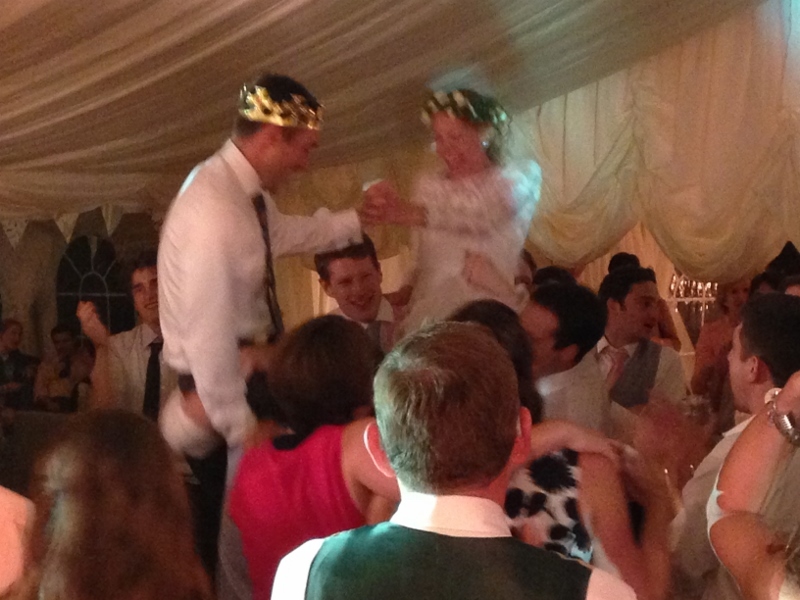 Their first dance caused quite a stir as it ran ‘It Had To Be You’ straight into ‘Gangnam Style’! Mr Swing struck up immediately afterwards and kept the room swinging ’til midnight. 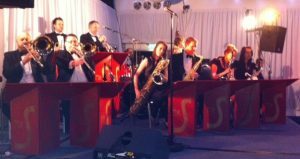 Ken and Jane contacted Mr Swing’s Dance Orchestra at the turn of the year but wanted to come and see the band in action before booking. The next time we were playing in their neck of the woods was a few months later at Rushpool Hall. When nobody approached us that night I assumed they’d made other plans for their wedding entertainment. On calling Ken and Jane a few days later I discovered they’d sent down their best man who’d listened from the car park as they were away! We must sound just as good from car parks as we do face to face! On the rainy night itself, Ken and Jane crammed a ridiculous number of people into a marquee and we had an amazing party. 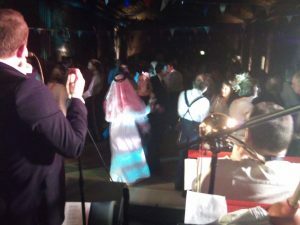 Despite water dripping through the marquee lining onto Martin, our drummer, we entertained the massive crowd with swing favourites and kept them on their feet all night. 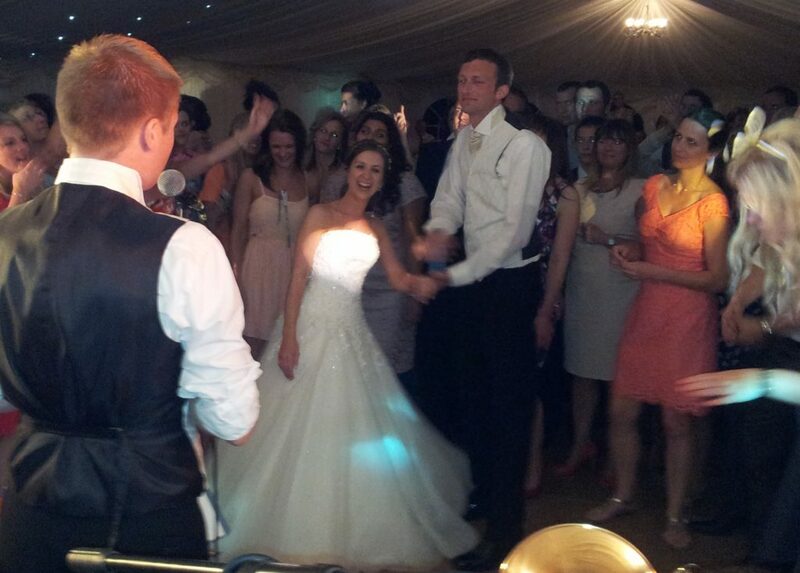 It was a pleasure to play at our colleague Owen’s wedding. Owen has played tenor sax with Mr Swing’s Dance Orchestra for ten years and when he announced he was getting married to the wonderful Daisy and tentatively asked if we’d play at the reception we jumped at the chance. 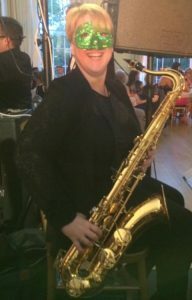 A good friend of the band, Sarah Potts, entertained guests in the afternoon, playing a selection of popular love songs on solo saxophone to set the mood. Owen and Daisy’s family and friends were a great crowd to play for in the evening and kept the floor packed throughout. As seen here, Owen played a few tunes on the night with Daisy joining in on maracas for ‘Copacabana’! 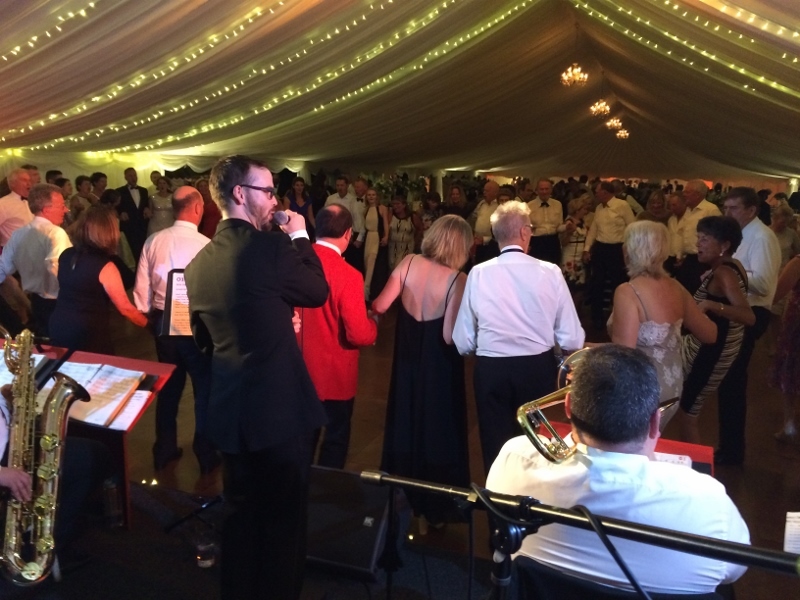 Mr Swing’s Dance Orchestra was honoured to be invited to play at the Gala Dinner of this weekend of celebrations for the Royal Mid Surrey Golf Club. There are Royal Golf Clubs dotted all over the Commonwealth and two delegates from each of these had been invited to attend. 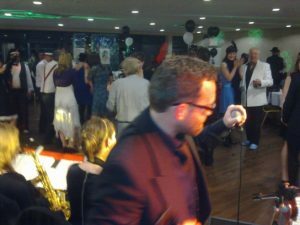 With guests from all over the world this really was a multi-national event and thankfully they were all fans of swing music. 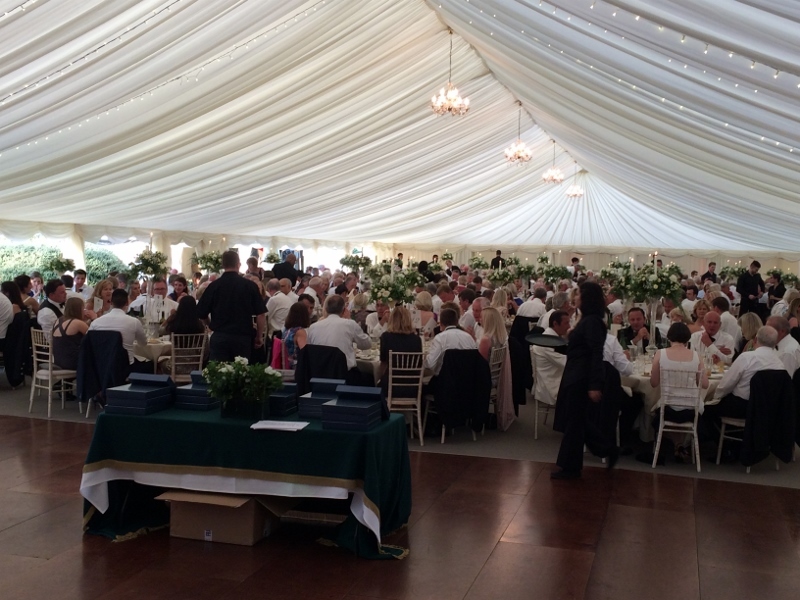 Over four hundred guests in total were packed into an enormous marquee and, once Sir Clive Woodward had finished his after-dinner speech, they packed the dance-floor. Even though we didn’t arrive home until almost breakfast time, it was well worth the trip. My best shoes are still engrained with sand though! It’s not often the band gets to play ‘Ain’t Nobody Here But Us Chickens’ whilst surrounded by the feathered creatures themselves but so it was at this venue at the foot of the North York Moors national park! 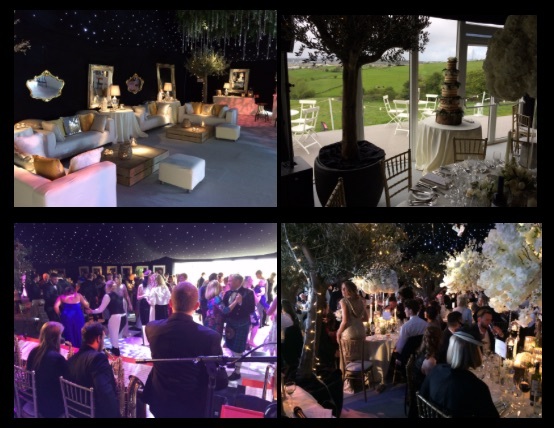 Mark and Pamela’s reception was held in a magnificent triple teepee marquee in the grounds of a country pub. Their well-rehearsed first dance was to Michael Bublé’s ‘Everything’ and everyone in Mr Swing’s Dance Orchestra agreed it was the most professional first dance they’d witnessed in a long time. Mr Swing’s own DJ stayed on after the band to keep the party in full swing until the witching hour. 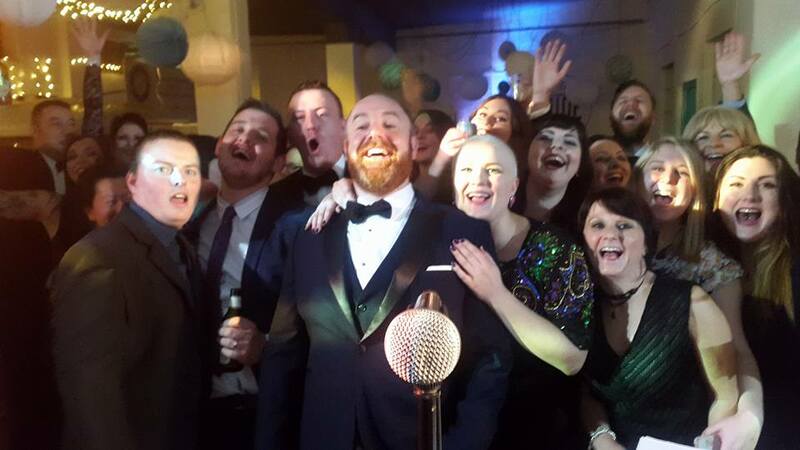 Roisin and Steve had booked Mr Swing’s Dance Orchestra a massive 22 months in advance of their wedding, so keen were they to secure our services! All the tables at the wedding breakfast were named after swing classics and the happy couple were thrilled we played ‘That Old Black Magic’ as that was the name they’d given the top table. Roisin spent the whole evening on the dancefloor, dancing to Mr Swing. Quite a feat in a full wedding dress! 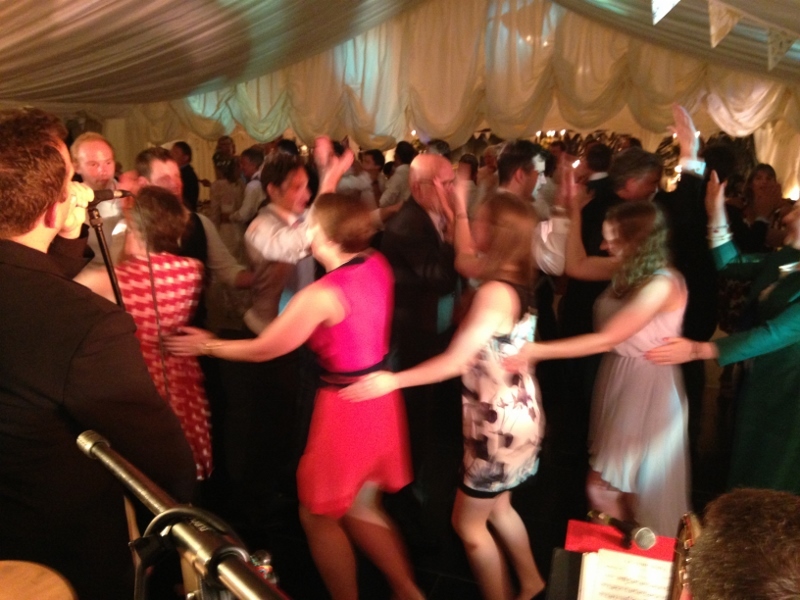 Mr Swing’s Dance Orchestra has performed in many wedding marquees over the years but nothing like this! Marcus and Loredana had really gone to town for their big day. Decorated, illuminated trees on the inside of the tent was a first for us….and we’ve seen some sights I can assure you. Every minute detail had been thought through, with hotel-like relaxation areas plus perfume, curling tongs, straighteners and even toothbrushes in the toilets! Mr Swing played for the drinks reception before the speeches and wedding breakfast, putting the guests in a great mood for the rest of the day. After the company had had to change venues not once but twice in the run up to this event, Mr Swing members were dreading a wild office party with riotous inebriated revelers causing havoc. How wrong we were! The band’s own DJ kept the party going long into the night, making this an office Christmas party we’d love to do every year. 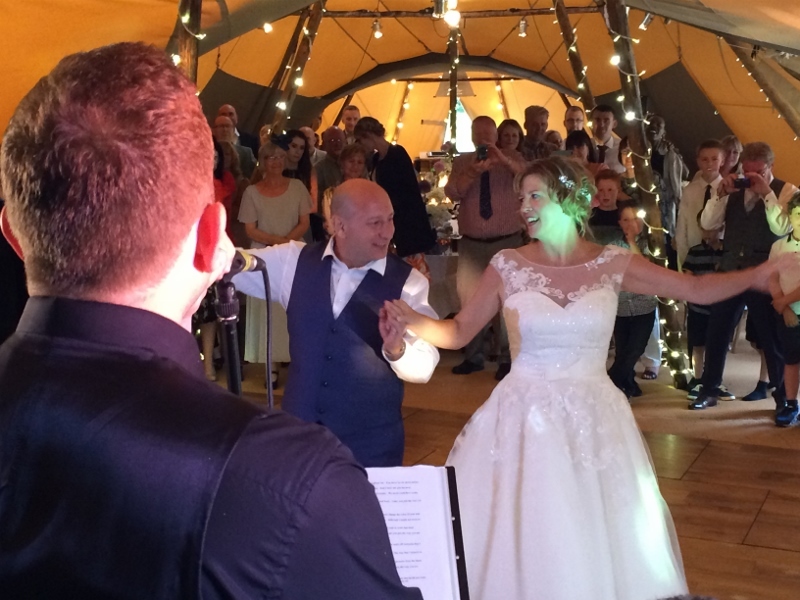 Michael and Katie had seen Mr Swing’s Dance Orchestra perform at the annual Thorp Perrow picnic event and decided the band was exactly what they wanted for their wedding. Mr Swing prepared a version of Wonderful World by Sam Cooke for their first dance at 7pm then, despite the early start, kept the dancefloor full for two hours before the band’s DJ took over until midnight. 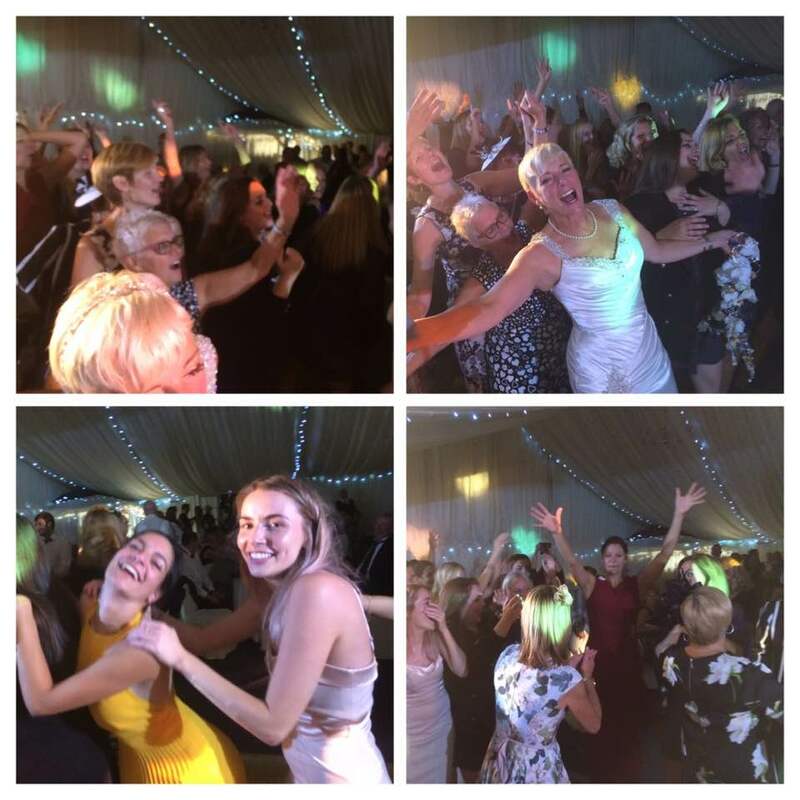 As you can see from the photographs, both the band and the guests had a great night….although there’s always that one guest who gets a bit too close! Being mad on the 1940s, Kelly had asked Mr Swing to start off proceedings with a set full of wartime classics and had chosen ‘Moonlight Serenade’ for her first dance with Ryan. 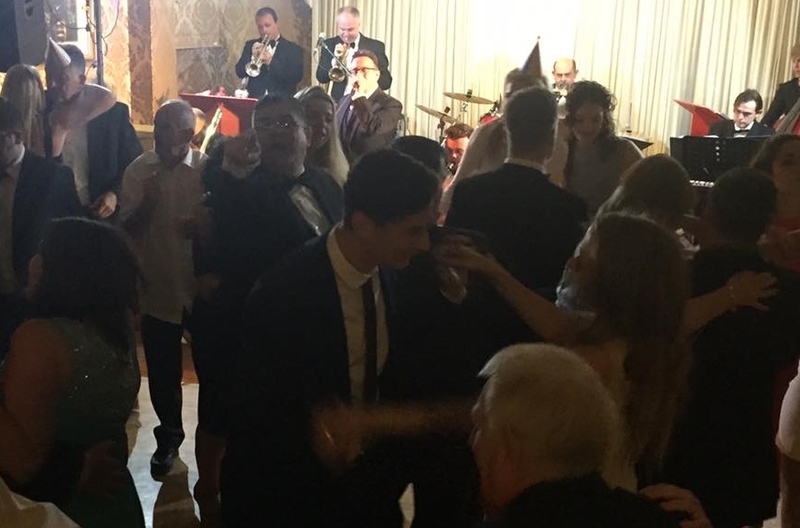 As the night went on, the repertoire moved forwards through the decades keeping guests dancing before heading back in time once more to play an encore of Benny Goodman’s ‘Sing Sing Sing’. 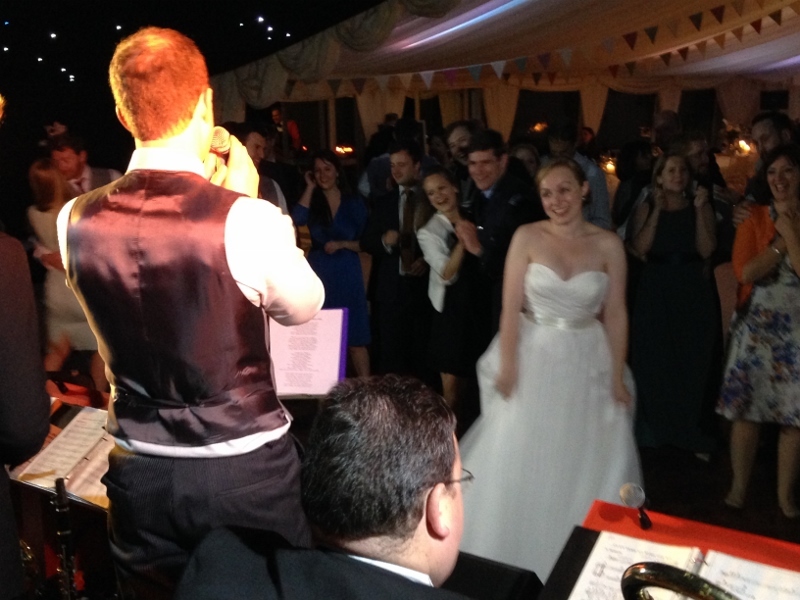 The bride and groom had chosen an eclectic DJ list too which kept the party going into the early hours. 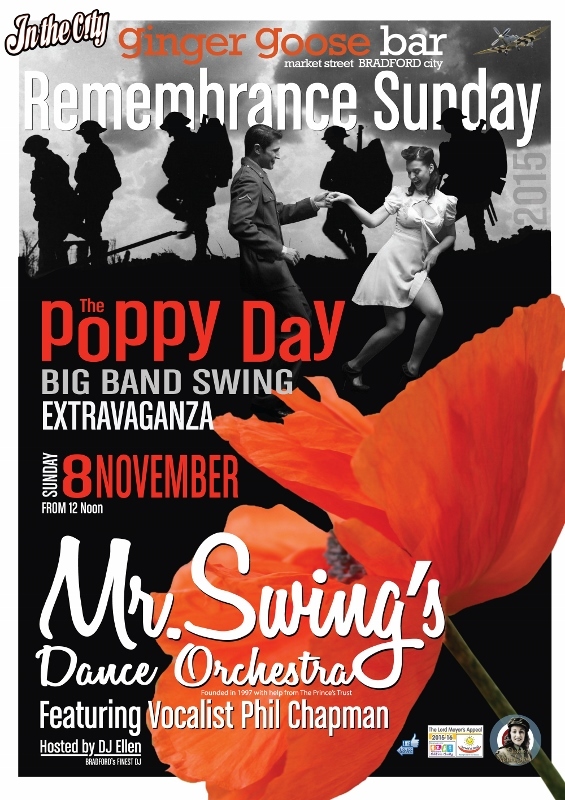 Mr Swing’s Dance Orchestra was honoured to be invited to play at this wonderful event. 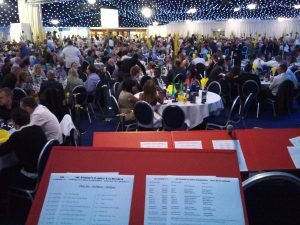 Compered on the night by Leeds United’s matchday host Jed Stone, two hundred guests played ‘Heads and Tails’ and ‘True or False’ games, entered raffles, bid on both silent and live auction lots, ate a great meal and, of course, danced to some wonderful music! It was possibly our longest conga line yet for ‘Amarillo’. Thousands of pounds were raised for this very worthwhile cause. More information on Oscar’s Paediatric Brain Tumour Charity can be found at www.oscarspbtc.org. Liz and Dave had rehearsed a secret first dance and needed Mr Swing’s help to give it maximum impact for their unsuspecting guests. After grabbing everyone’s attention with Benny Goodman’s ‘Sing Sing Sing’ we invited the happy couple onto the dancefloor to smooch to ‘Moonlight Serenade’. 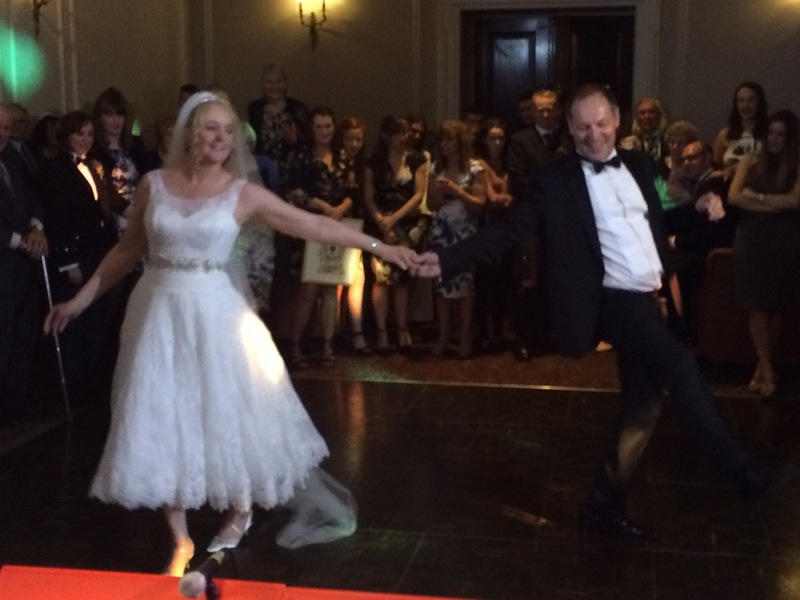 After playing a shortened version, and with family and friends gathered round taking photographs, I threw Liz and Dave a couple of walking canes and they launched into a brilliant dance routine to Morecambe and Wise’s ‘Bring Me Sunshine’. Needless to say, it went down a storm! 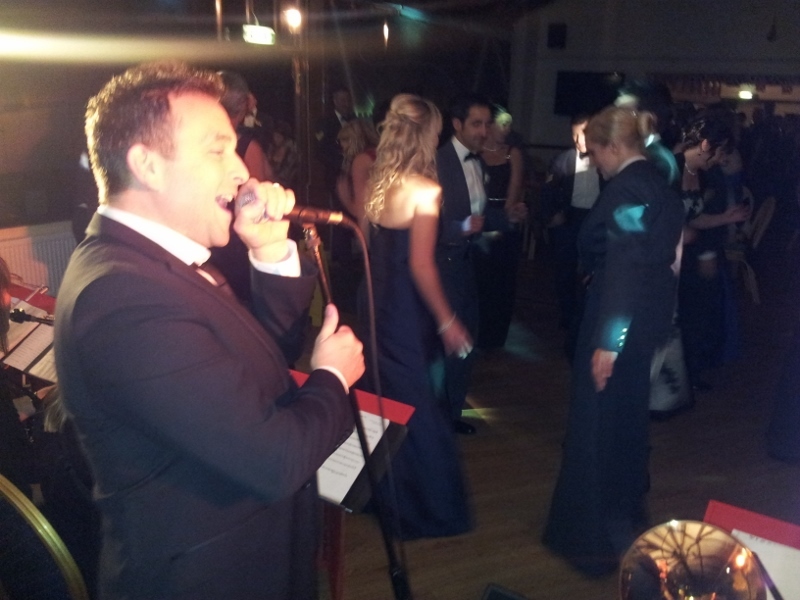 With band and DJ having taken guests’ requests prior to the occasion, a great night was had by all. After playing for numerous public dances at the De Grey Rooms, this was Mr Swing’s Dance Orchestra’s first wedding gig in this beautiful building. It had been an atrocious day for weather with torrential rain throughout but this hadn’t dampened spirits one little bit! 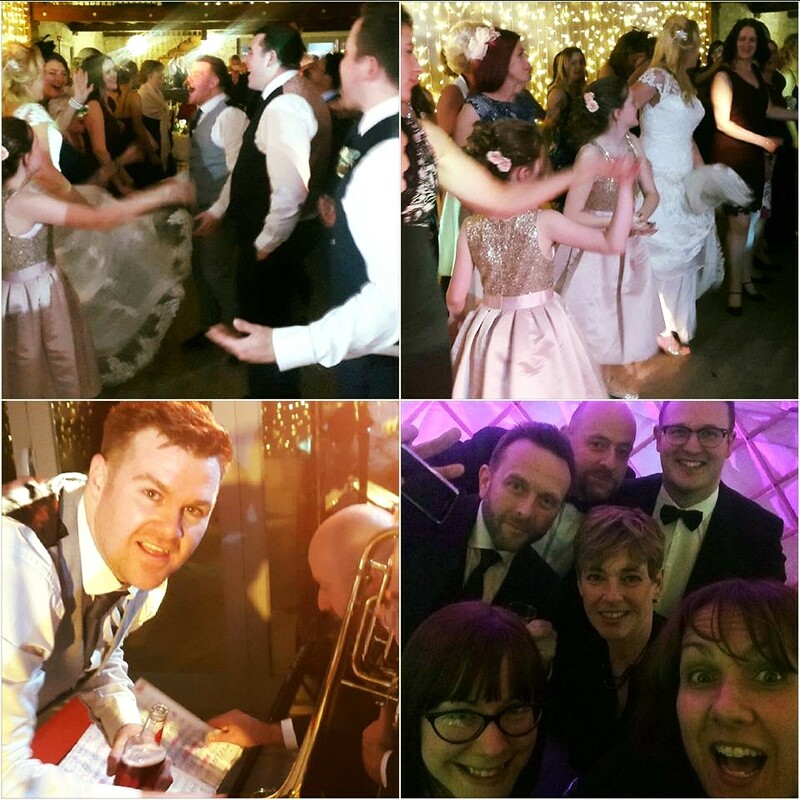 From the bride and groom’s first dance ‘It Had To Be You’ to Jude and Chris leading congas around the room to ‘Amarillo’, Mr Swing’s Dance Orchestra and DJ entertained family and friends with timeless classics and guest’s requests. 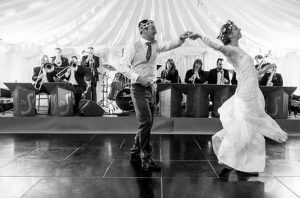 Faye and Carl had seen Mr Swing’s Dance Orchestra in action at their friend’s Sophie and Ben’s wedding at Rowley Manor sixteen months earlier (see 2015 reviews) and had loved the night so much they booked the band for their own reception. The first wedding Mr Swing ever played for was at The Parsonage and it’s always good to return to this lovely venue. 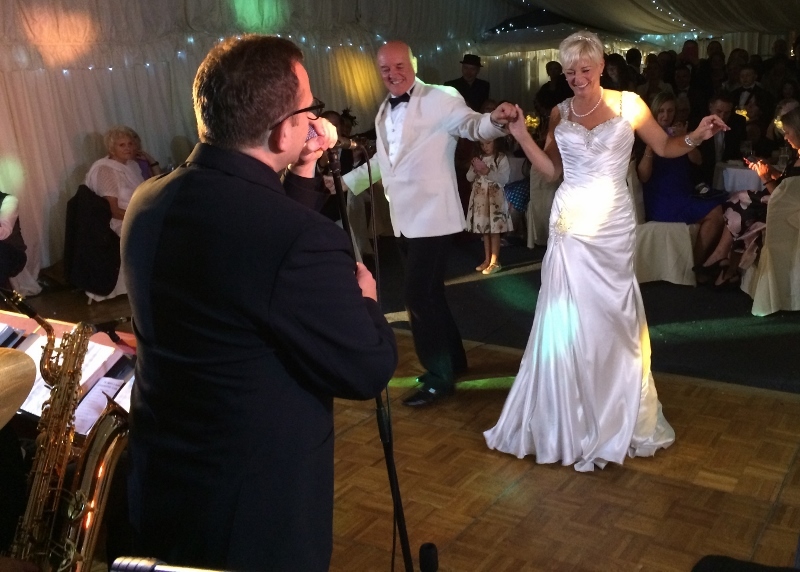 Faye and Carl chose ‘It Had To Be You’ for their first dance and this kicked off a wonderful evening. Graham and Gilly were celebrating their 25th wedding anniversary which also happened to fall in the same year as their daughter Laura’s 21st and their son Harry’s 18th. Good excuse for a party? You betcha! 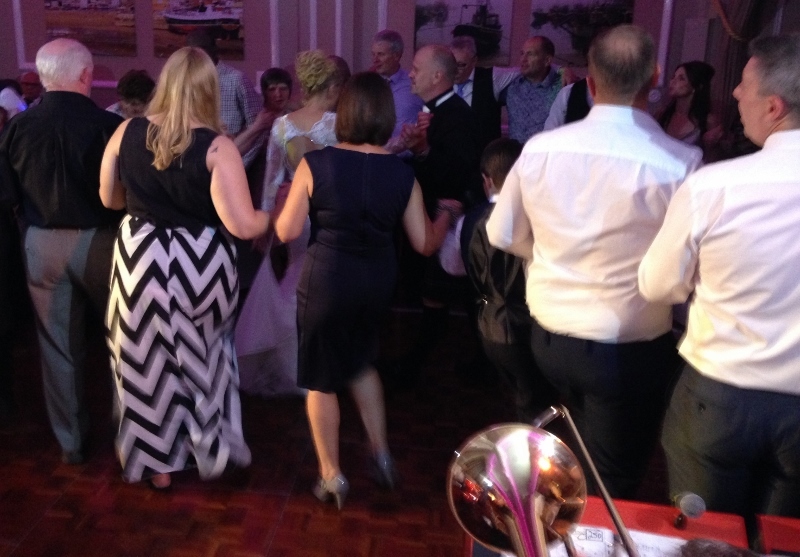 With family and friends based in both York and Teeside, Graham and Gilly chose The George Hotel in the lovely village of Piercebridge near Darlington as their venue; an unassuming roadside pub hiding a beautiful ballroom overlooking the river and bridge. Graham was looking for an authentic band to play original arrangements of classic swing tunes and Mr Swing’s Dance Orchestra dutifully obliged – even learning his favourite Louis Jordan song, ‘Ain’t Nobody Here But Us Chickens’. As darkness fell, everyone took to the floor to dance the night away, some playing inflatable saxophones! It takes all sorts. 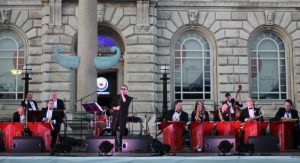 Following our performance at the Royal Hall for Children In Need last November, dancer James White invited Mr Swing’s Dance Orchestra back to this stunning venue to play for a charity dance in aid of The Rainbow Fund. The Royal Hall is an amazing venue in which to perform and members of the band enjoyed joining in the mass dance class during one of the intervals. Cuban breaks and pivots galore! 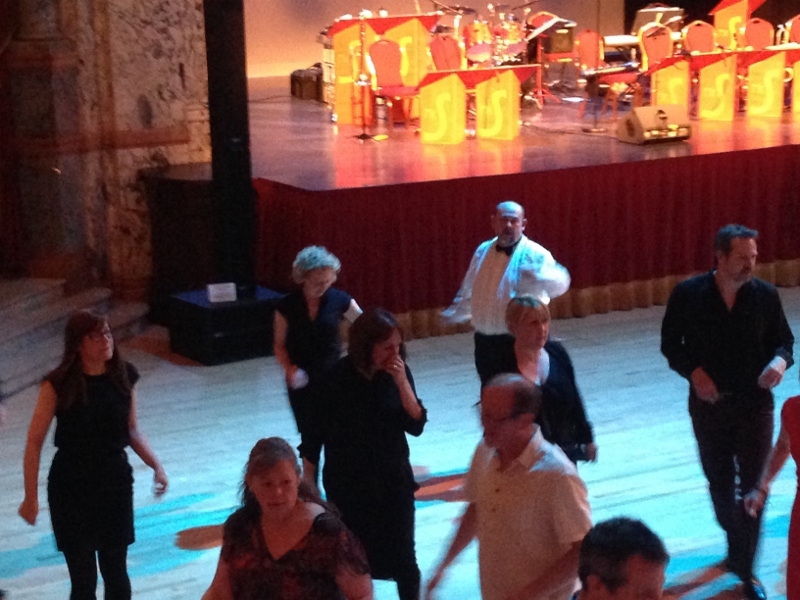 Mr Swing’s Dance Orchestra played to a sellout room in York’s sumptuous De Grey Ballroom. Dancers travelled from far and wide to grace the floor and show off their ballroom and latin moves. Mr Swing’s drummer Martin, and his wife Jean, held a beginners’ dance class earlier in the evening and those that took part competed in a beginners’ Strictly dance-off later on to the band’s live performance. There were two further Strictly competitions for more experienced dancers and the dancing continued between live sets with recorded music. 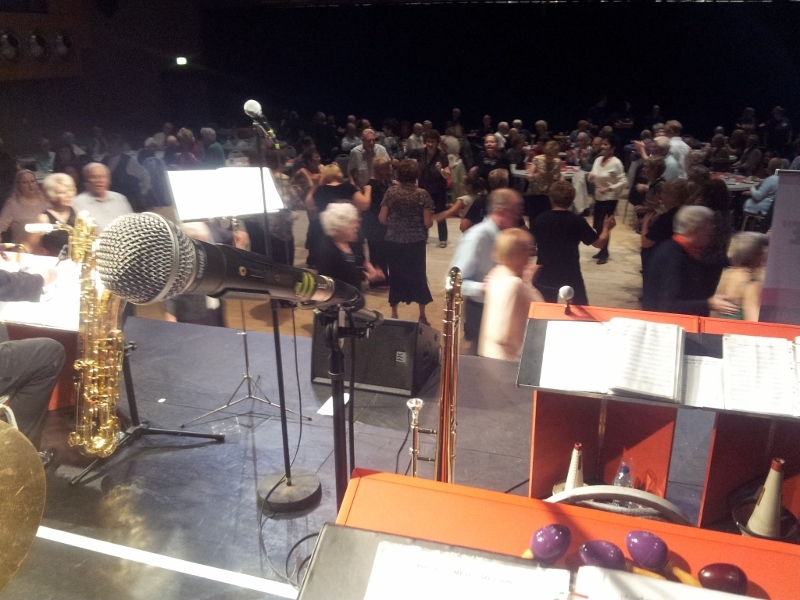 A great night was had by all and we’ll be back in November for another Strictly Big Band Night. It’s been a while since Mr Swing’s Dance Orchestra were this far north but this crowd were well worth the trip! Helen and Greg had chosen the beautiful surroundings of Northumberland’s Doxford Hall for their wedding and, after a long day of celebrations, their guests were keen to let their hair down which they did to The Jungle Book’s ‘I Wanna Be Like You’ immediately following the happy couple’s first dance ‘Let There Be Love’. 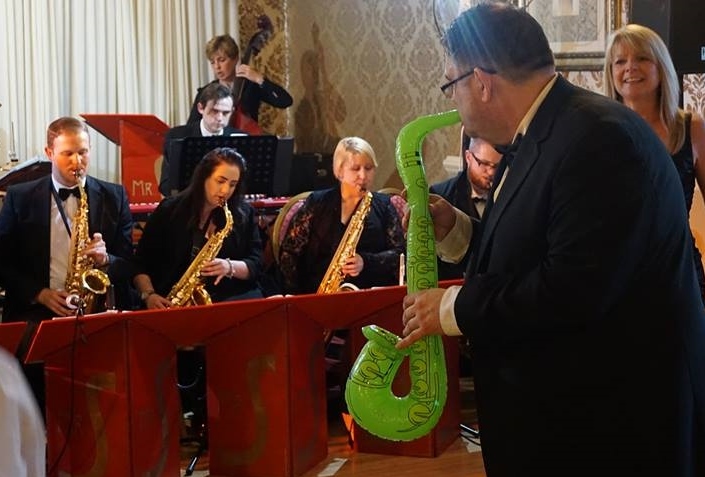 Mr Swing entertained the audience with swing band classics culminating in a rousing performance of ‘New York New York’ before the band’s own DJ rounded off the evening. As usual, this year’s Christmas Balls were a total sellout, getting booked up by the end of September. It was great to see new groups joining us as well as old friends who have been attending for years, some since our first events in 1997! 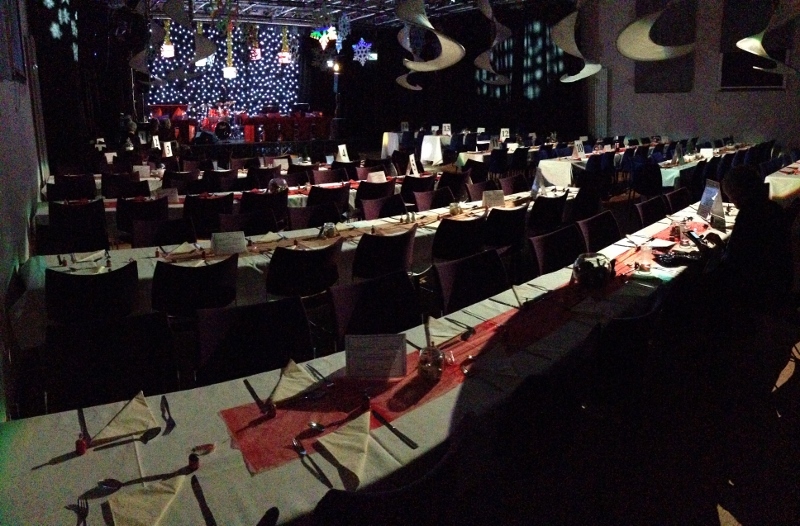 Temple Hall looked magnificent, with its tables set up beautifully in anticipation of the nights ahead. The food received many a compliment, offering four main courses and three desserts, and the magician, Adam Baxter, went down a treat. 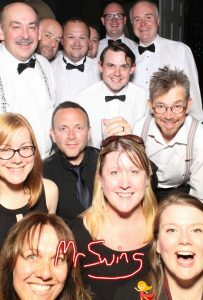 Mr Swing’s Dance Orchestra kept the dancefloor full throughout the evening and £1300 was raised for the York branch of the Multiple Sclerosis Society. Book early for next year! 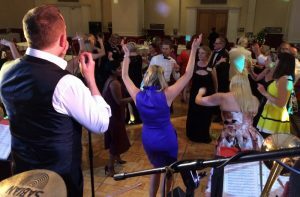 Mr Swing did its bit for Children In Need this year by providing live music for the ballroom and latin section of Harrogate dance teacher James White’s 24-hour danceathon. The fundraiser took place in Harrogate’s impressive Royal Hall and ran from 2pm on Friday all the way through the night til 4:30pm on Saturday. We arrived to set up at 6pm with the event already in full swing and were soon joined by Pudsey himself (or one of his helpers) who was put through his paces on the dancefloor. I just had time to take this photo before Mr Swing’s Dance Orchestra took to the stage as the venue filled up for the evening session. 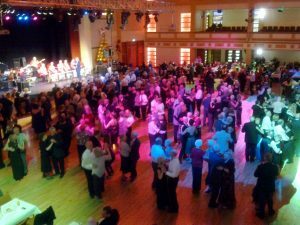 We played quicksteps, foxtrots, waltzes, jives, cha chas and rumbas plus a few specialist dances such as The Charleston, Gay Gordons and St. Bernard’s Waltz between 8 and 11pm before a salsa band arrived for the midnight shift! 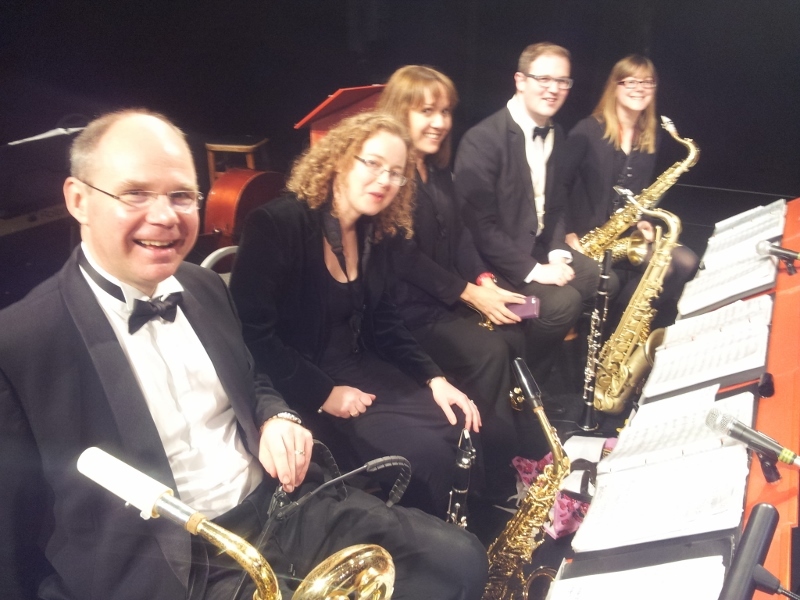 We were very proud to be invited once again to play a wartime swing gig following Bradford’s Remembrance Day parade. As last year, fantastic posters had been produced to advertise the event and the venue was packed to the rafters with people of all ages enjoying the music. 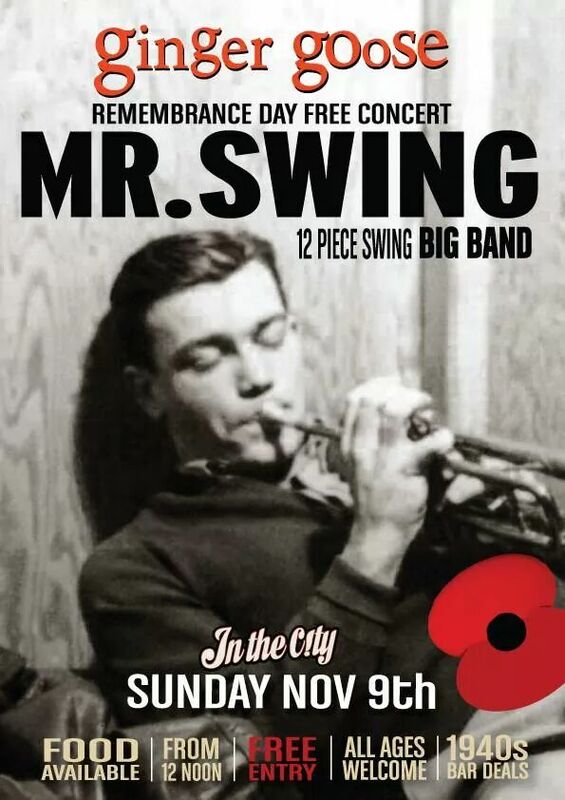 As you’d expect, Mr Swing’s performance was packed full of Glenn Miller favourites as well as other timeless classics from the 30s and 40s. Roll on next year! 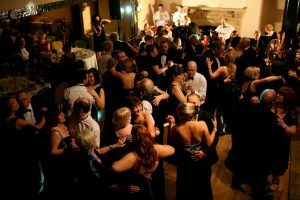 …but once the ‘Gentlemen, you may remove your jackets’ announcement is made everybody relaxes, dancing into the early hours to Mr Swing and the band’s own DJ. This event just gets better and better! As usual, the crowd surpassed itself, with gazebos galore erected….one even sported bunting! 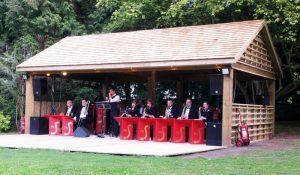 This year’s picnic concert saw Mr Swing’s Dance Orchestra christen the brand new purpose-built stage at Thorp Perrow which had only been finished the previous day. As darkness fell, and dancing legs were sufficiently wine-filled, the picnickers rose seemingly as one to party the night away. What a fantastic wedding crowd we played for! When Frankie’s mother and the three bridesmaids left for church, followed by Frankie and her father in beautiful vintage cars, I knew this was going to be a day to remember. All parties looked stunning in their dresses and morning suits and, with the forecast rain nowhere to be seen, the marquee was all set for the day’s festivities. Whilst Frankie and Rob were saying their vows, the caterers prepared the wedding breakfast and bar and I set up the stage for the evening’s party. 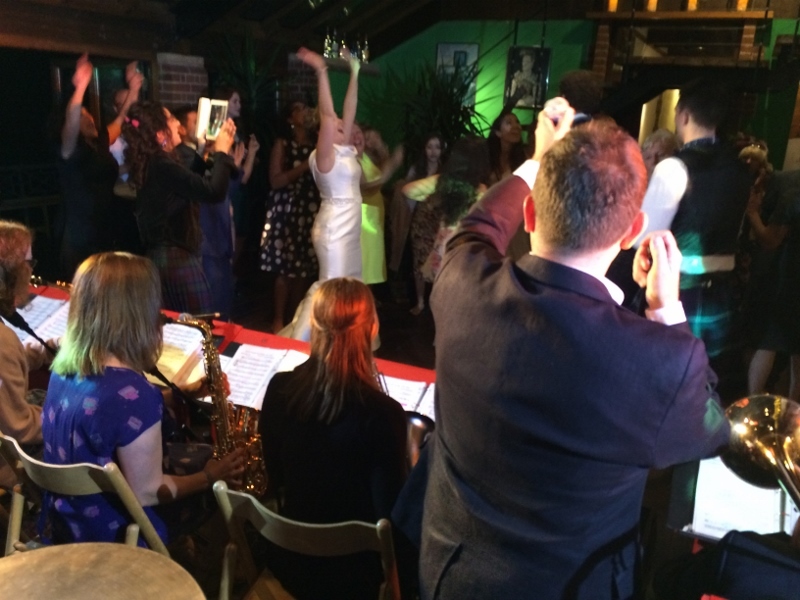 After being well fed and watered, Mr Swing’s Dance Orchestra took to the stage at about 9:30pm. All the guests bar none literally ran to the dancefloor as soon as we struck up with Benny Goodman’s ‘Sing Sing Sing’ before Rob and Frankie danced their first dance as husband and wife to ‘They Can’t Take That Away From Me’. The floor remained full throughout the whole two-hour performance with highlights seeing everybody sitting down rowing imaginary canoes to ‘Hawaii 5-0’, Frankie’s team of girls winning the sing-off in ‘Delilah’ and the longest conga lines ever in ‘Amarillo’. 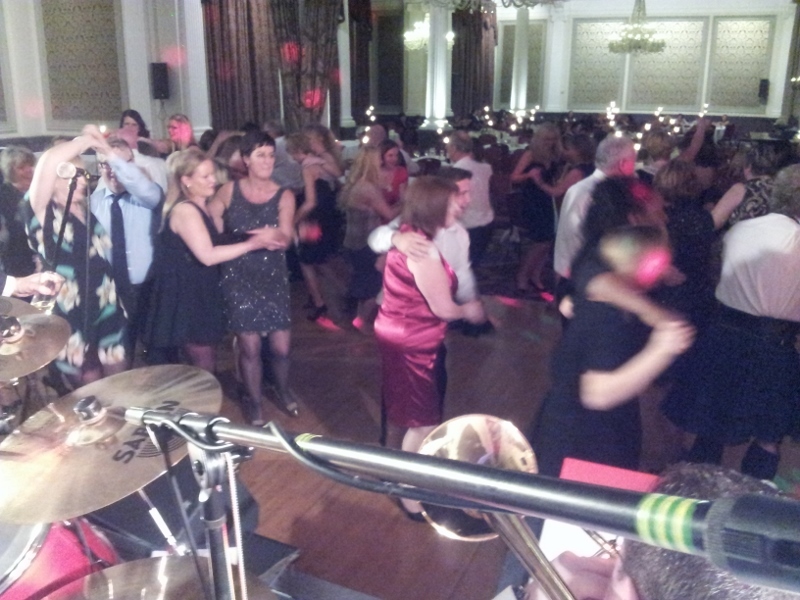 Mr Swing’s Dance Orchestra entertained quite an eclectic crowd at this event in York’s historic De Grey Rooms. 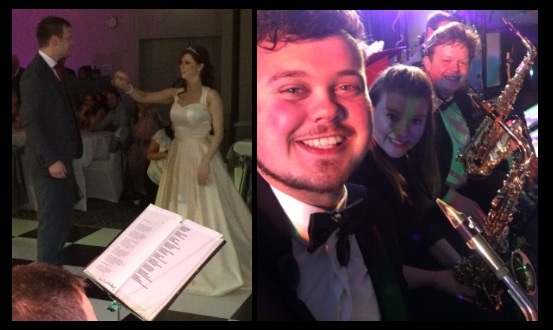 York Theatre Royal held a Summer Masked Ball in their beautiful sister venue, with an audience made up of ballroom dancers, big band fans and revellers including a hen party! Our drummer’s wife, Jean Harvey, ran a beginners’ dance class for an hour before the main event. A group of thirty or so were put through their paces being taught some moves for a jive and a social foxtrot. Guests arrived at 7:30pm and were welcomed with a glass of fizz and some very tasty looking canapés before Mr Swing’s Dance Orchestra played styles to suit all attendees, with those who had attended the earlier dance lesson keen to try out their new skills and many of the band augmenting their attire to suit the evening’s theme. What a gorgeous venue! With an elegant twin staircase sweeping down into the good-sized function room, Gisborough Hall Hotel really knows how to cater for weddings. Lesley had styled everything herself, down to the minutist detail, and the room looked amazing. 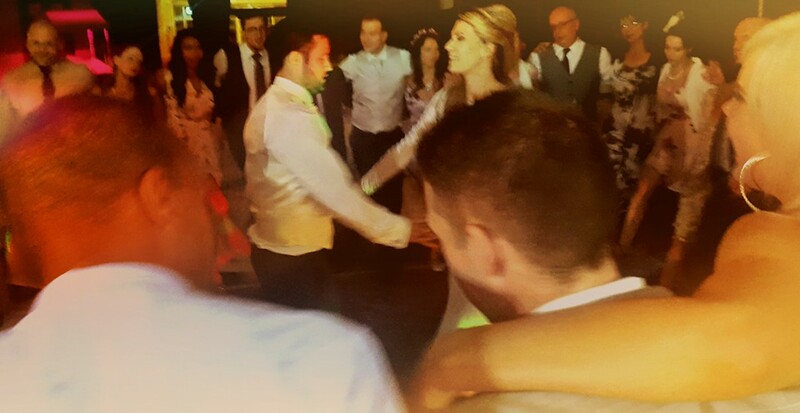 Mr Swing’s Dance Orchestra played ‘For Once In My Life’ for the happy couple’s first dance and, with Mario being italian, Dean Martin’s ‘That’s Amoré’ and ‘Mambo Italiano’ went down particularly well! What an amazing group of people we played for at Rowley Manor! 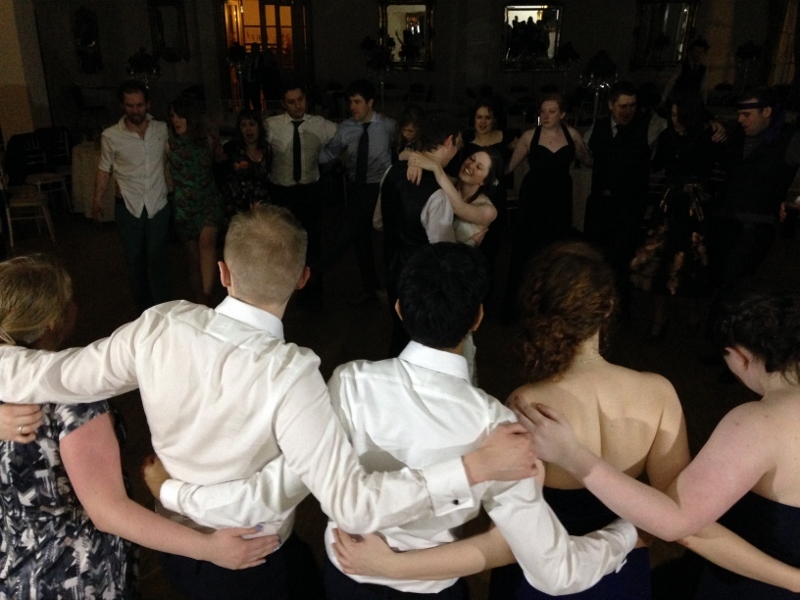 Sophie, Ben and their guests danced non-stop throughout Mr Swing’s three 40-minute sets. From the first dance ‘For Once In My Life’ to the ‘Amarillo’ congas over three hours later, these wedding goers filled the dancefloor; a tremendous effort from one and all! There was a personal connection too. 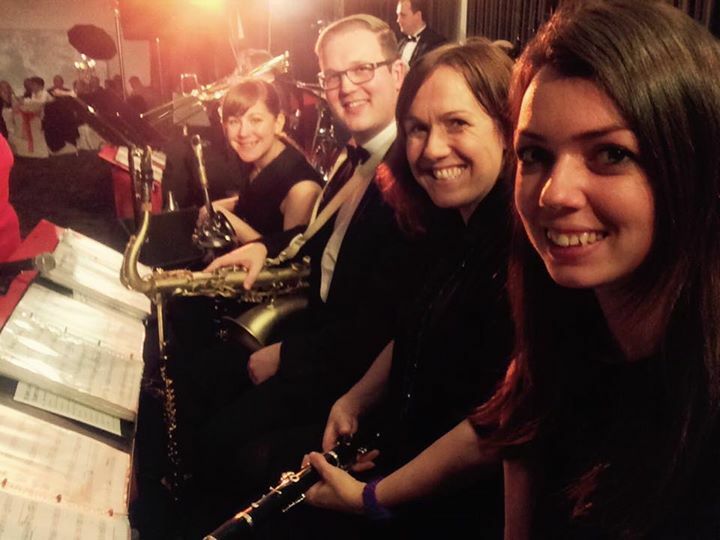 Mr Swing’s lead alto player, Rachael Hammerton, had taught Sophie the flute whilst she was at school and Rachael took the opportunity to catch up with many former students. 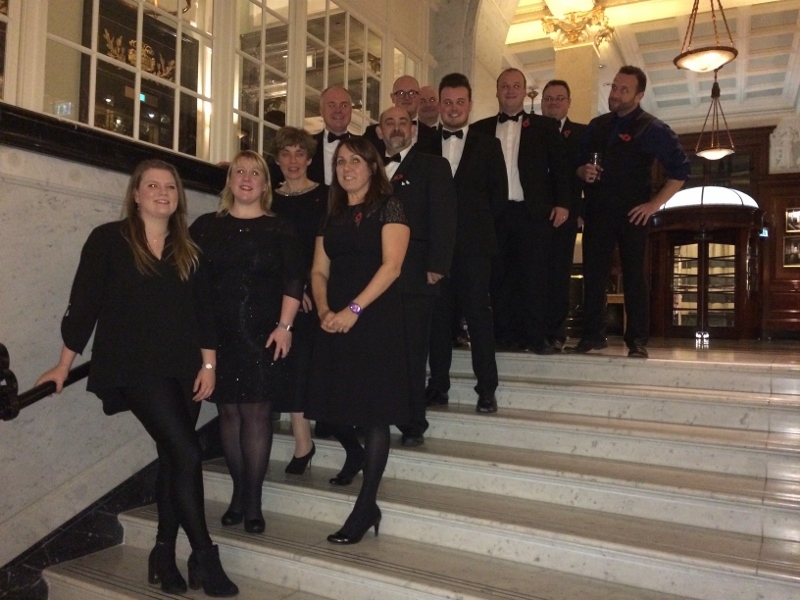 What a great night we had helping to raise money for The Melanie Beattie Appeal Fund in Liverpool! Well in excess of 200 guests enjoyed a sumptious meal before being royally entertained by Mr Swing’s Dance Orchestra with the dancefloor full throughout. Money was raised on the night by means of a raffle and an auction with Mr Swing’s very own bass player Jill bidding highest on one of the lots; Director’s Box tickets to a Premier League match at Goodison Park! 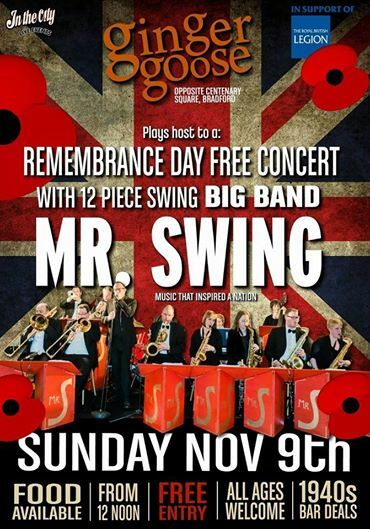 Mr Swing’s Dance Orchestra was very honoured to be invited to play a concert on Remembrance Sunday to commemorate the 100th anniversary of the start of The Great War. The band doesn’t play music that dates back as far as as 1914 however, so we concentrated on putting together a programme that would have been heard in dance halls during WWII. The venue really went to town on the advertising, producing amazing posters, flyers and advertising hoardings as well as writing press releases and getting an all-important endorsement from The Royal British Legion. If truth be told, members of the band were a little anxious about performing in a city centre pub, especially as Bradford City were playing in the FA Cup and the start of the concert coincided with kick-off time, but any fears were soon allayed as The Ginger Goose filled and filled and filled until it was bursting at the seams with people from all walks of life from families with children to ex-servicemen sporting medals. Mr Swing’s Dance Orchestra played plenty of Glenn Miller favourites, as you’d expect, interspersed with well-known songs of the period so everyone could have a good sing-song. And each tune was met with rapturous applause. All in all an amazing afternoon. I have never had my hand shaken by so many people after a performance. We truly made people’s day. Needless to say we’re currently in negotiations to do it all again next year! Now, all Bradford City Council has to do is sort out its city centre road layout so we can get near enough to the venue to unload without having to go down ‘bus-only’ roads and incur £60 fines! It’s not often Mr Swing’s Dance Orchestra plays at daytime events but when the Middleton NHS came calling wanting live music for an over-60s tea dance to help promote their services it sounded like a great idea and the band was only too happy to help out. 500 free tickets had been given out to attend one of the three sessions the band was playing between 11:45am and 3:30pm. The idea being that the first group would leave after the first session as the second group arrived to take their place. Once there though, most people stayed for the remainder of the day and by mid-afternoon the arena was packed to the rafters! 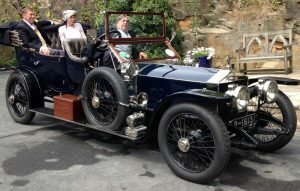 The whole thing was deemed a great success by the organisers who hope to repeat the event next year. 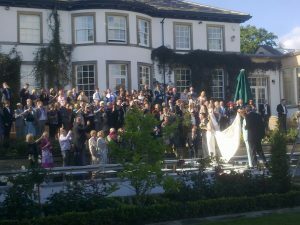 The sun was shining, the sky was blue and all the guests were well up for a party! Will and Lisa had chosen ‘It Had To Be You’ as their first dance and had rehearsed some lovely moves to impress their family and friends. 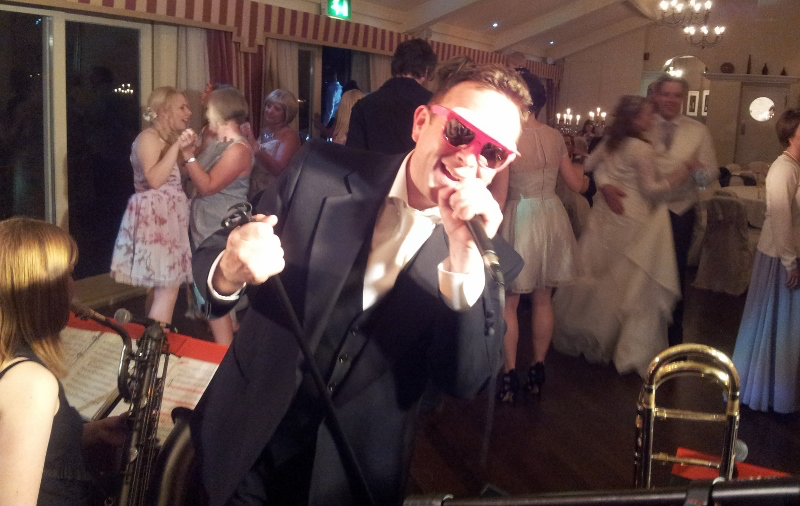 As the night went on, the stag night lads donated their stylish pink shades to Mr Swing’s vocalist, Phil Chapman…! We had played at this event before and were very pleased to be invited back, this time to the impressive Imperial War Museum and a great day out was had by all! The client had requested a 20-piece band so I set to work constructing and painting a few new ‘Mr S’ music stands and bolstering our ranks. The celebrity guest this time was Natasha Kaplinski who we played onto the stage each time with the ‘Strictly Come Dancing’ theme. Natasha was lovely and very happy to pose with us after the gig. What an amazing start to 2014! 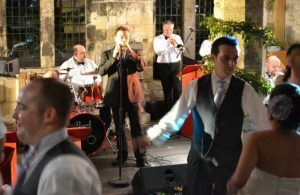 We had played at Helen’s sister’s wedding at Durham Castle in 2011 and were very pleased to be invited to entertain the family again. The bride and groom had put together a tremendous routine for their first dance (pictured below) and this set the scene for a great night, culminating in by far the noisiest audience participation ending we’ve enjoyed for quite some time. What a great gig! The room looked amazing, especially as the red Mr Swing stands matched the red theme that Shirel and Michael had chosen. 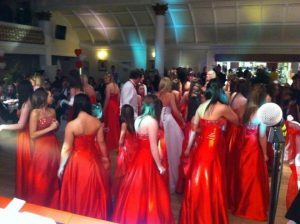 And the red theme continued in abundance as not one, not two but 36 bridesmaids (yes 36, not a typo!) arrived wearing identical red dresses! Shirel runs a cheerleading club and had enlisted her troupe in performing carefully choreographed dances, joining the bride and groom after their first dance. When it came to ‘Delilah’, instead of the customary boys versus girls or bride’s family and friends versus those of the groom, we ended up with mothers versus daughters! What a night! What a night we had!! This was one hell of a party. The venue (scene of a summer solstice festival every year) was packed to the rafters with revellers hell bent on celebrating Caroline and Guy’s big day. 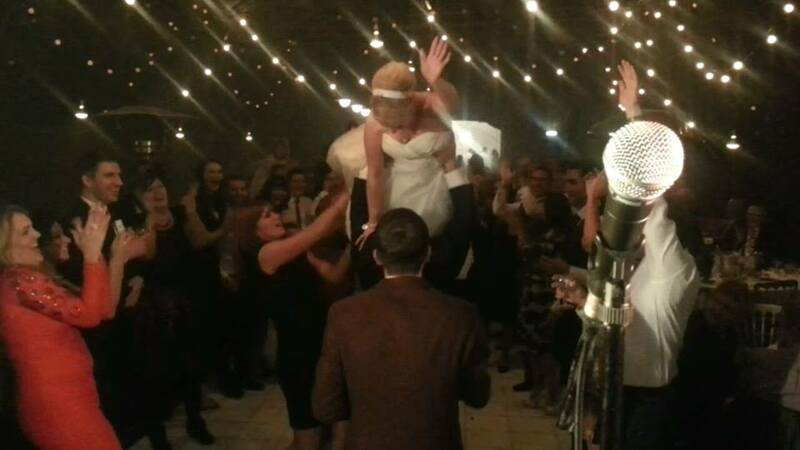 This photo shows the bride being lifted aloft during a rousing rendition of ‘Sweet Caroline’ (what else!). By the end of Mr Swing’s performance health and safety had been hoofed into touch with party-goers surfing on tables and canoeing on each others shoulders to ‘Hawaii 5-0’! Another great night at RAF Leeming! 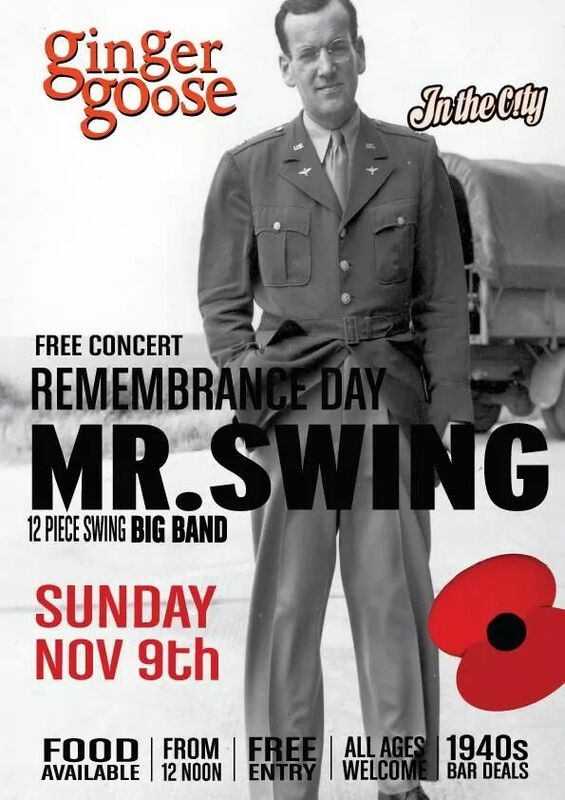 This is one of Mr Swing’s favourite events and the band looks forward to it every year. An added attraction this time around was a Spitfire dogfight simulator. Interesting to know that trombonists are best at playing ‘war’! All in all another great night with the dancefloor packed from start to finish. 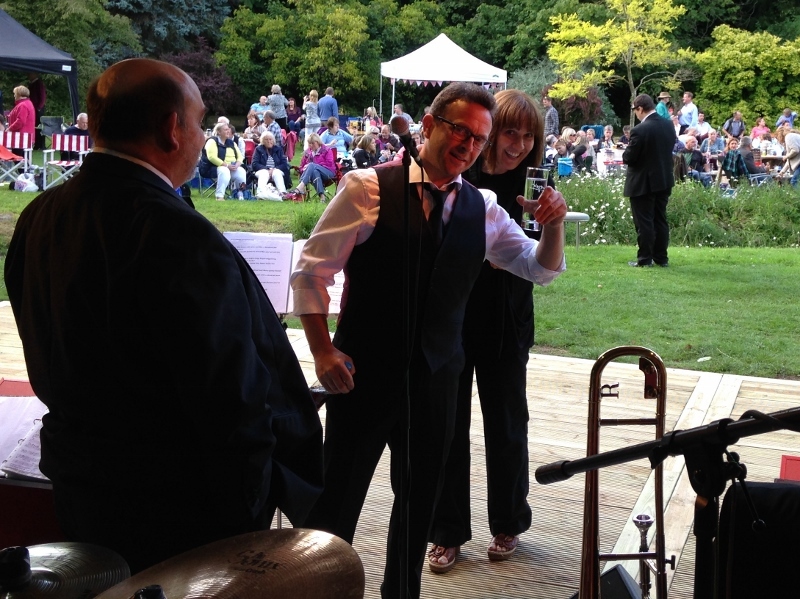 This was Mr Swing’s seventh year among the trees at Thorp Perrow and it proved to be the best yet. 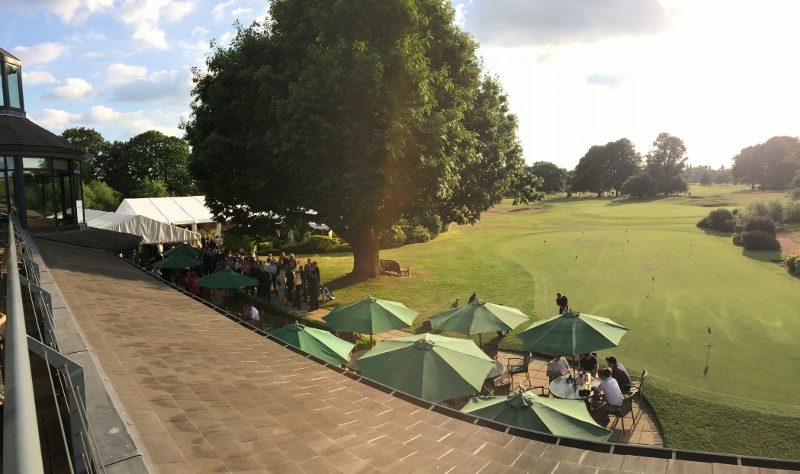 The glorious weather attracted so many people that the venue ran out of printed tickets a few days before the event! 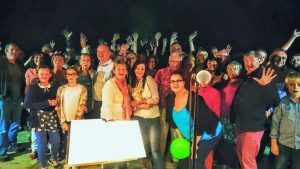 Well over two hundred picnickers packed the lawn opposite the stage where they were royally entertained with swing band classics. Much Pimm’s and wine was consumed until everyone was on their feet as darkness fell, dancing the night away. This is just one section of the vast crowd…. There was a trans-Atlantic feel to this wedding as Jack’s from the other side of the pond and many of his friends and family had made the trip over for the big day. All the Ratpack favourites went down very well as you’d expect and Mr Swing’s Dance Orchestra were joined on stage towards the end of the evening by Groomsman Patrick performing a terrific rendition of ‘Sweet Caroline’. 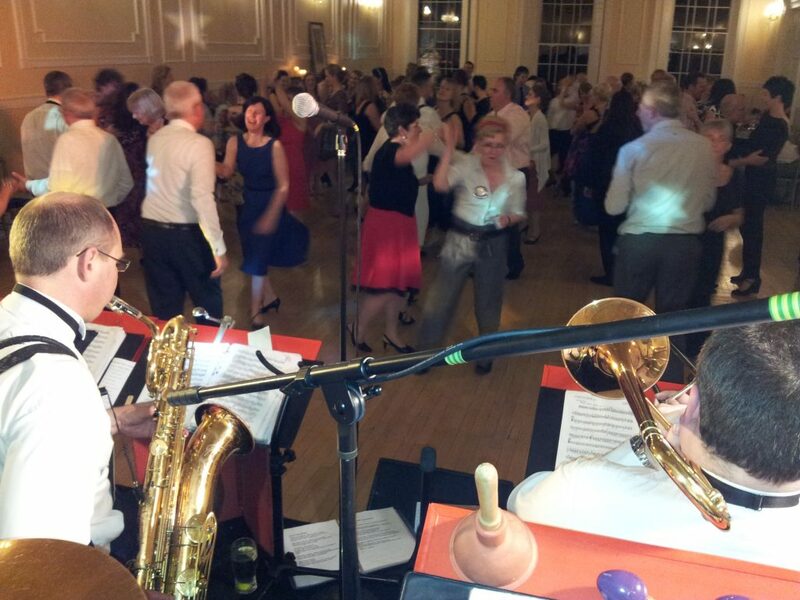 The first Big Band Dance Night of the year held at York’s beautiful De Grey Rooms was a great success. The impressive Georgian ballroom was sold out with 120 dancers filling the floor from start to finish. ‘Jean Harvey Dance’ ran an hour’s lesson beforehand for around 50 beginners who were keen to show off their new moves when Mr Swing’s Dance Orchestra took to the stage. 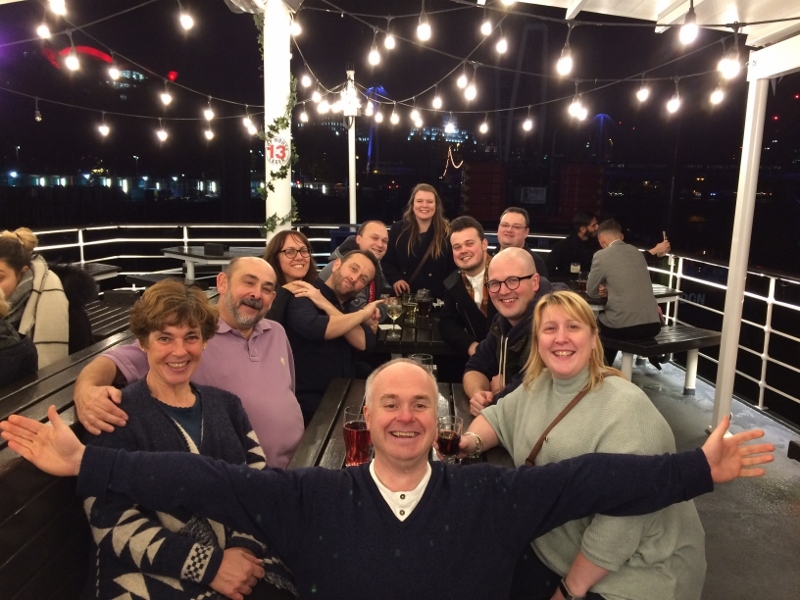 You’d be forgiven for thinking our audience was mainly made up of octogenarians pushing zimmer frames but this event marked the final night of the conference for those learned folk working in the field of geriatrics! It’s a gig the Yorkshire swing band has done a couple of times before and, as usual after a few days heavy conferencing, everyone was ready to let their hair down. Mr Swing went down so well they’ve already booked us for next year. It was an honour to be invited back to play for the wonderful supporters of St. Gemma’s Hospice. Well over 300 guests raised a massive £25,000 for the charity with raffles, auctions and quizzes keeping the money rolling in during the evening. Mr Swing’s Dance Orchestra went down well with the chessboard dancefloor remaining full throughout. This one had been a long time coming. 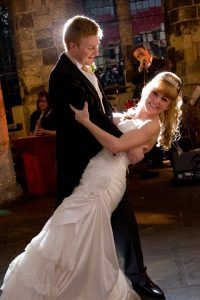 Jill and Simon had booked Mr Swing for their big day in October 2010! As the guests played lawn games after the wedding breakfast and speeches I set up in the beautiful Winter Rooms of Beamish Hall. All pillars and ornate features with a white lace starcloth as a backdrop to the band. The bride and groom had chosen Dean Martin’s That’s Amoré as their first dance; a dance they had to do twice as some of their guests were busy finishing a nailbiting game of croquet and missed the first rendition! The evening was rounded off in traditional style with family and friends circling the happy couple in ‘New York New York’ before Jill and Simon lead the congas to ‘Amarillo’. Déjà vu! Our second May wedding at York’s beautiful Hospitium. This time it was the turn of Beth and Carl who met on the Ultimate Frisbee team at York University. Many family and friends had seen the happy couple exit the ceremony to the finale music from Star Wars earlier in the day and were well up for a party in the evening. With Beth hailing from New York, there was a good number of guests from the Big Apple dancing away to Mr Swing’s rendition of Rat-pack favourites. Sinatra’s New York New York was an obvious choice and the encore of Neil Diamond’s Sweet Caroline went down a storm, especially with the transatlantic crowd who were heard shouting “So good, so good, so good” in the choruses. Talk of Engelbert and Jedward’s Eurovision hopes was somewhat lost on them though! The downstairs room at The Hospitium is perfect for dancing and everyone was up on their feet from start to finish; the highlight being the four bridesmaids choosing an usher each to dance with to ‘I Get A Kick Out Of You’. 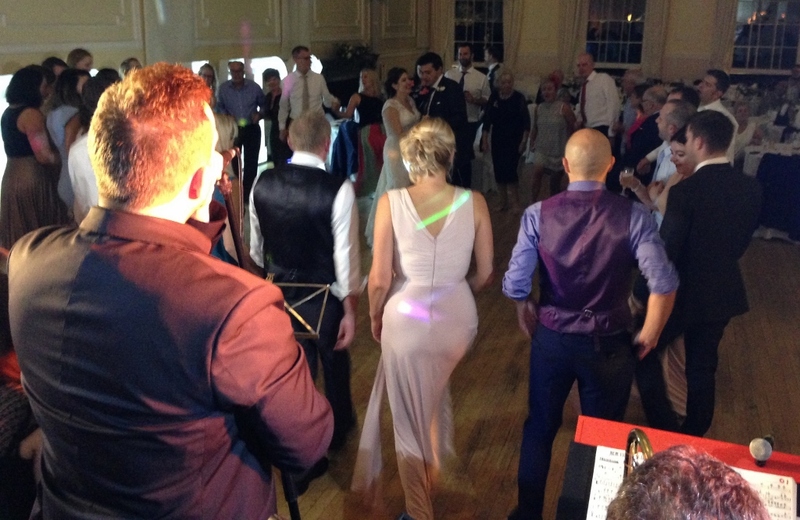 A really great night in one of York’s best wedding venues. 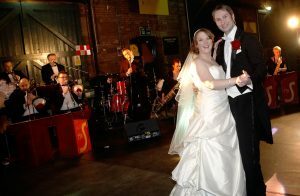 Katy and Matt had chosen the beautiful surroundings of the National Railway Museum in York for their wedding ceremony and reception. Over 100 friends and family were there to join in the celebrations. The Yorkshire swing band went down very well with the well-dressed guests as you can see (thank you to Brian Harte Photography)…. What a great event Mr Swing attended at the weekend. Pocklington School had gone for a wartime theme for their end of year bash and they’d pulled out all the stops. The old station hall at Pocklington Station (now the school’s gym!) had been transformed into a scene straight out of the 40s. There were union flags as far as the eye could see, patriotic bunting, parachutes hanging from the ceiling and even a Battle of Britain dogfight going on overhead courtesy of the art department. All the waiting staff were decked out in camouflage and the loos were air raid shelters stacked up with sandbags. 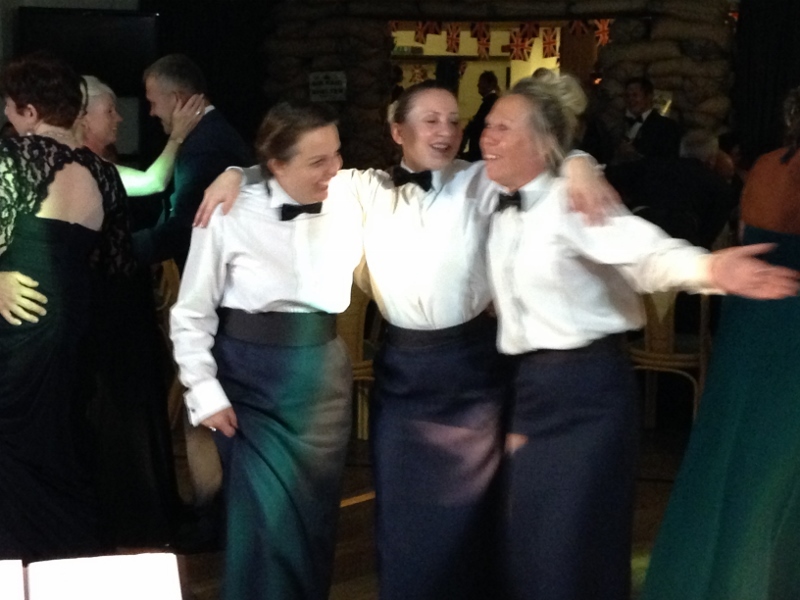 The 300 guests had also gone to town on their costumes, with people in forces uniforms, landgirl outfits, nurses, even a sheik! And an authentic air raid warning siren called them to dinner. 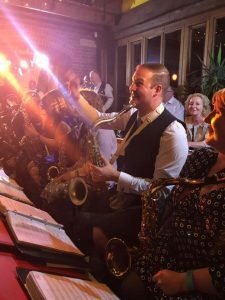 Mr Swing’s Dance Orchestra took to the camouflage-netted stage just after 10pm and kept the dancefloor jam-packed til well after midnight, playing a mixture of swing band classics with a generous helping of 40s tunes thrown in for good measure. All in all the Yorkshire swing band had a tremendous evening and hope to play for this audience many times in the future. We were very excited to be invited back to the amazing Centenary Pavilion at Leeds United for their end of season awards evening. The whole squad were there, signing autographs for the 960 guests as they arrived. The manager, Simon Grayson, and chairman, Ken Bates, made speeches during dinner before the players’ awards ceremony began to constant standing ovations. Finally it was Mr Swing’s turn to entertain. 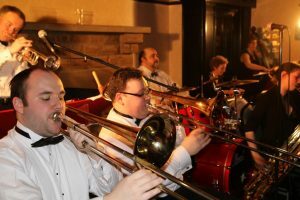 Due to the extraordinary number of people to fit in for dinner, Mr Swing’s Dance Orchestra was some way from the dancefloor but we managed to get our swing and big band classics across through the melee. 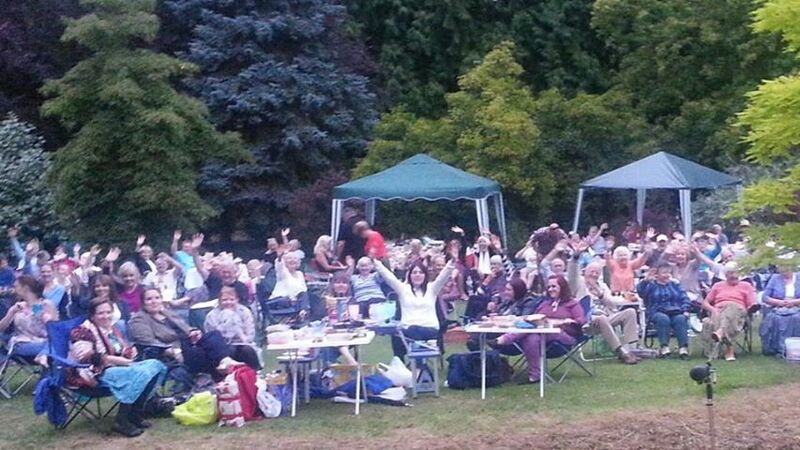 The Tom Jones trilogy went down a storm and Leeds swing band fans danced the night away! Karen’s husband Jon, a cameraman for the BBC, had organised a superb evening for nigh on 200 family and friends up in the North East. Once they had booked Mr Swing’s Dance Orchestra it occurred to them that, to do it justice, they should learn a few ballroom dance moves. So they and a few dozen of their friends dutifully attended dance classes leading up to the big day. On the night itself I was informed they’d learnt a foxtrot, quickstep, jive and cha cha so I chose one example of each from the Mr Swing setlist and the band played the ‘Strictly Come Dancing’ theme tune to introduce a mass dance off on each occasion. This was a first for Mr Swing. Never before had we had an audience so dedicated to the cause! Needless to say, the band went down a storm and its members really appreciated the immensely positive response from the guests. 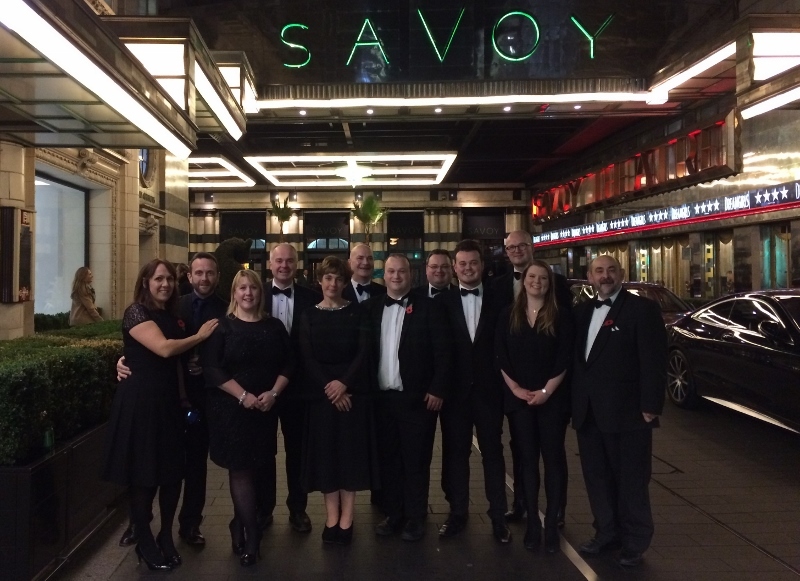 Donations were invited on the night to Darlington Breast Cancer Care – a charity close to Karen’s heart. 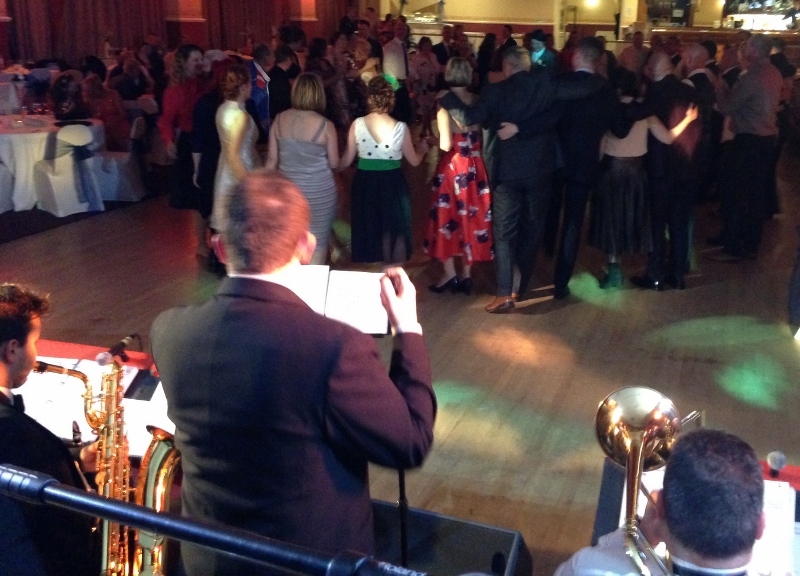 Jon descibed Mr Swing’s Dance Orchestra as the best swing band in the North East! 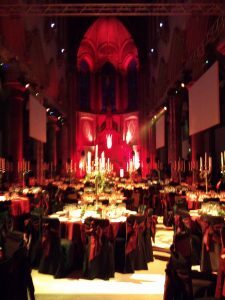 Mr Swing’s Dance Orchestra was very honoured indeed to be invited to play at this national awards dinner in the majestic Manchester Monastery. What an amazing venue! Six big screens had been erected to show live pictures from around the huge venue and an extraordinary number of moving lights made the whole event very similar to the Oscars. 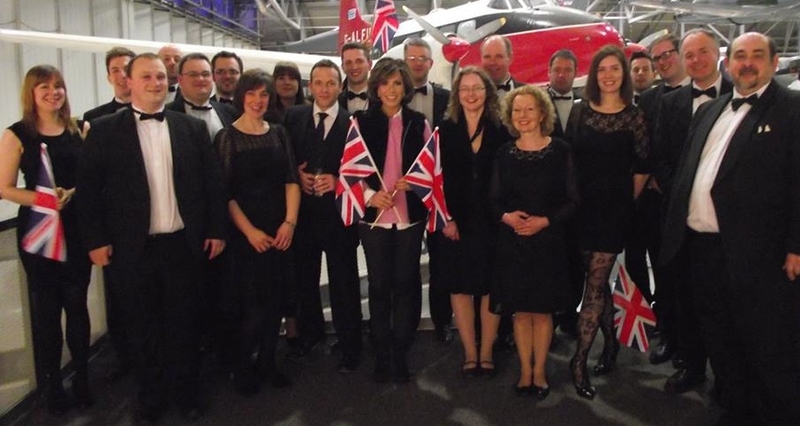 Fiona Bruce hosted the evening and the hundreds of guests were entertained by the Manchester Citadel Choir between courses before the four glitzy girls of Siren electric string quartet took to the stage amidst backing tracks and pirotechnics. Finally, at 11:30pm, with the crowd chomping at the bit, it was time to let them get up and dance to Mr Swing’s Dance Orchestra. And dance they did. 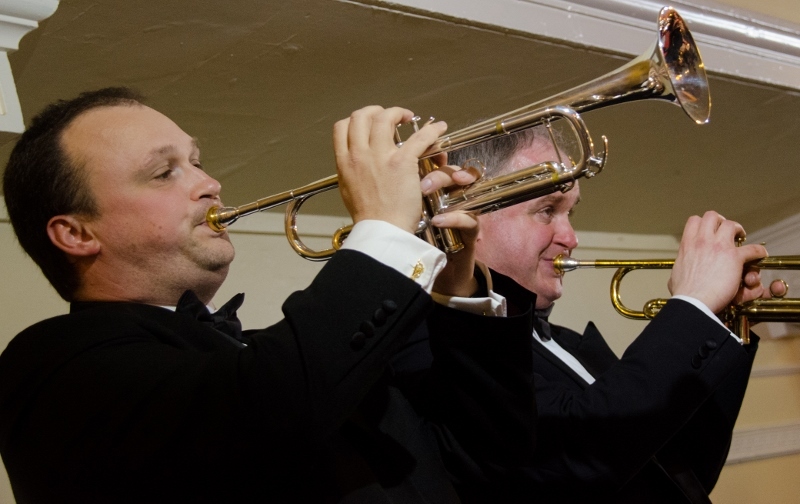 Solidly for ninety minutes, as if they didn’t see many swing bands in Manchester! We don’t seem to be able to do a gig these days without somebody in the band being propositioned. This time it was the turn of lead tenor player Owen Newby but, being the laid back character he is, he took it all in his stride. 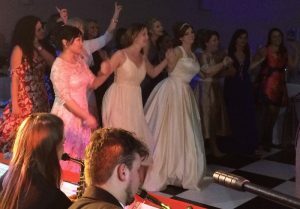 There had been so much snow up in Yorkshire during the week that I was worried the swing band wouldn’t make it down for Katie and Lucy’s big day but make it we did and I’m so glad. What a brilliant event! 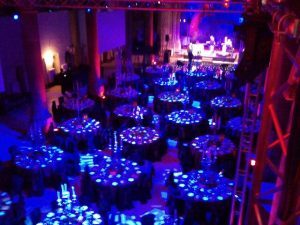 The hospitality of the staff and caterers was second to none and the lighting technician did an amazing job lighting the London swing band venue and the band itself. The dancefloor was packed from the first dance to the last. One of Mr Swing’s members even appeared on the floor at one point having been whisked off his feet by a guest during the final smooch of the evening ‘Moonlight Serenade’! The highlight for me, though, was seeing dozens of party-goers with roses in their mouths, tangoing to ‘La Cumparsita’ a la Jack Lemmon and ‘Oswald’ dance from ‘Some Like It Hot’ while Tony Curtis seduced Marilyn Monroe on Oswald’s yacht. Classic! All in all well worth the weather-related stress, the early morning start and the 5:30am return – we’d even had time to visit the Winter Wonderland in Hyde Park. Beautiful. Well, where do I start?? 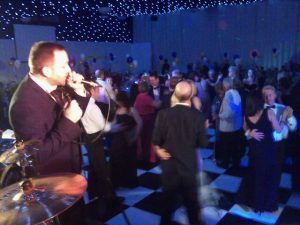 Mr Swing had been invited to perform at the prestigious opening evening of Yorkshire’s largest conference and events venue and it really lives up to its billing. 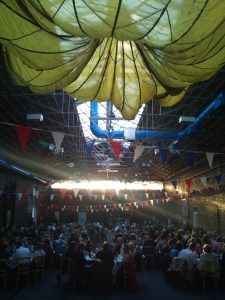 It can seat up to 1400 people to dinner and truly is a rather swish facility and a truly amazing West Yorkshire swing band venue. Anyway, on to the gig itself. Important bods from all across the county and beyond had been invited and well over 200 companies were represented. Mr Swing took centre stage (quite literally as there were three of them!) 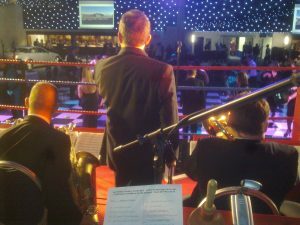 and was performing in a genuine twenty foot square boxing ring! No joke. Another potential use of the venue it seems. The guests were entertained during the meal by an up and coming young (10!) comedian, Jack Carroll, who has already appeared on The One Show with Jason Manford. Tenors Unlimited followed each course (stage right), singing popular operatic toons with a bit of Mickey Bubbles thrown in for good measure. Some members of Mr Swing are still undergoing counselling. A burlesque dance troop made up of five very trim young ladies……..until you looked a bit closer. Suffice it to say that I really can’t go into more details on this website. 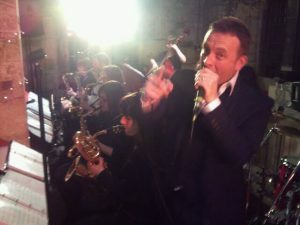 Mr Swing took over for dancing for the last hour; its musicians shellshocked…..
What an amazing venue! With amazing views! And such a welcoming crowd. I arrived early in the day to get set up in the marquee behind a ‘reveal’ curtain as Mr Swing’s Dance Orchestra was to be a surprise to the guests immediately after the speeches. The big reveal worked well and after the swing band’s customary opening of ‘Sing Sing Sing’, Chris and Gill’s first dance, ‘Can’t take my eyes off you’, had the camera bulbs flashing away. I had noticed various bekilted gentlemen in attendance so slotted ‘The Gay Gordons’ into the second set, much to the appreciation of the scottish contingent. We had to time its inclusion to coincide with the BBC’s coverage of the last night of the Proms switching from BBC2 to BBC1 as it’s an instrumental number which gave our BBC employed singer the four minutes he needed on his laptop to ensure the Middlesbrough region made the switch successfully! 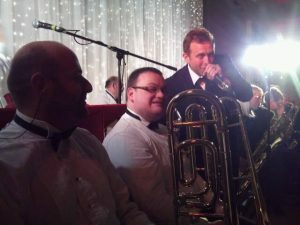 Who says swing bands in Yorkshire can’t multi-task?! What a wonderful evening we had at Thorp Perrow Arboretum on Saturday. 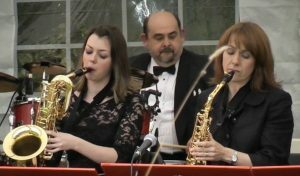 It was our fourth year of this outdoor event and a friendly and responsive audience tucked into their picnics as Mr Swing’s Dance Orchestra entertained them with classic swing band favourites. As dusk descended and wine flowed the crowd got to their feet to swing their hips and dance the night away. By the end of the third set everybody was singing along to the North Yorkshire swing band’s renditions of ‘The Candy Man’ and ‘Things’. These really are great evenings and we hope to see you all again next year. If you haven’t been before, keep an eye on the Public Events page for next year’s date. Lots of family and friends in attendance to witness the birthday boy himself joining the ranks of Mr Swing’s Dance Orchestra on 3rd trombone. Unfortunately Barnaby was rather too inebriated to remember how to play the damned thing and complained that the music was ‘all fuzzy’! And what we saw when the kilted man was rowing around the dancefloor to ‘Hawaii 5-0’ will haunt me forever! 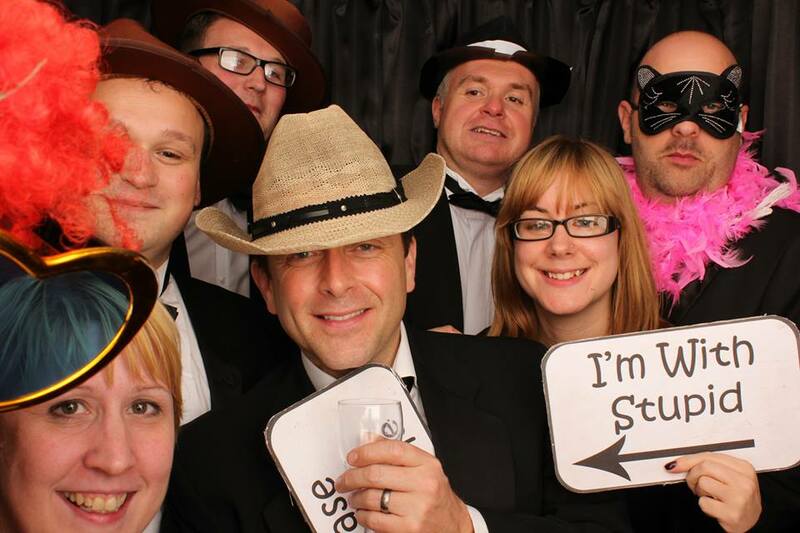 East Yorkshire swing band fans know how to party! Guy and Karen enjoyed wonderful weather for their wedding last weekend along with a great venue for York swing bands in York Maze. When I arrived to set up, guests had just finished their meal and were engaged in a cricket match in the glorious sunshine whilst the children (and a few adults it must be said) played on a giant inflatable pillow – just one of the attractions York Maze has to offer. 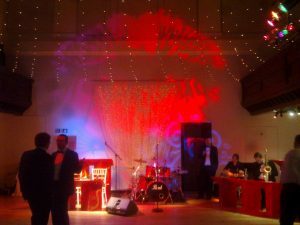 The venue itself is a good sized room with an excellent high and spacious stage, perfect for Mr Swing’s Dance Orchestra. 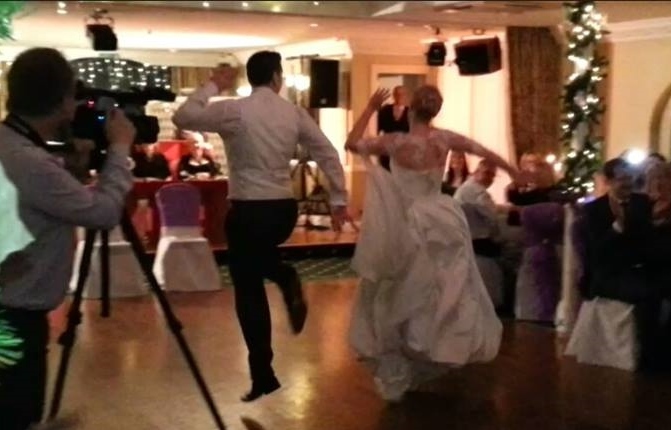 Guy and Karen had chosen ‘It Had To Be You’ as their first dance and we followed this up with a specially rehearsed arrangement of ‘My Funny Valentine’ for Karen’s mum, Anne. All the best to the happy couple from all at Mr Swing. When Mr Swing recorded a CD back in 2002, the producer for the week was Alex Browne. This was Alex’s sister Sam’s wedding and she and her fiancé, Stefan, had gone for a gangster theme. All the ladies were decked out as gangster’s molls or flapper girls, while the gents donned suits and trilbies. There were even a few tommy guns in evidence! 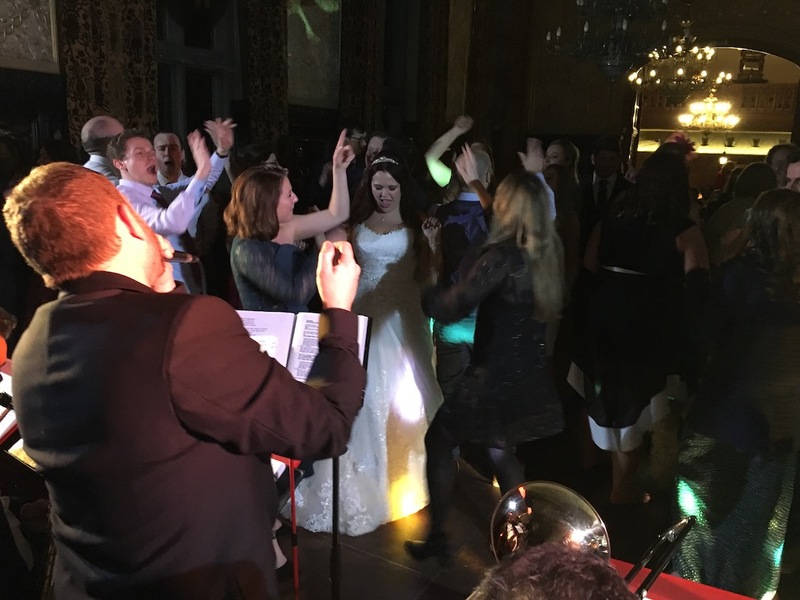 Julie from Fortissimo entertained the guests as they arrived and during the meal before Mr Swing’s Dance Orchestra invited Sam and Stefan onto the floor for their first dance, ‘We have all the time in the World’. To fit in with the occasion much was made of the gangster-themed ‘Bad Bad Leroy Brown’ and ‘Mack the Knife’. In fact Phil managed to slip in a good many gangster-related comments throughout the evening. 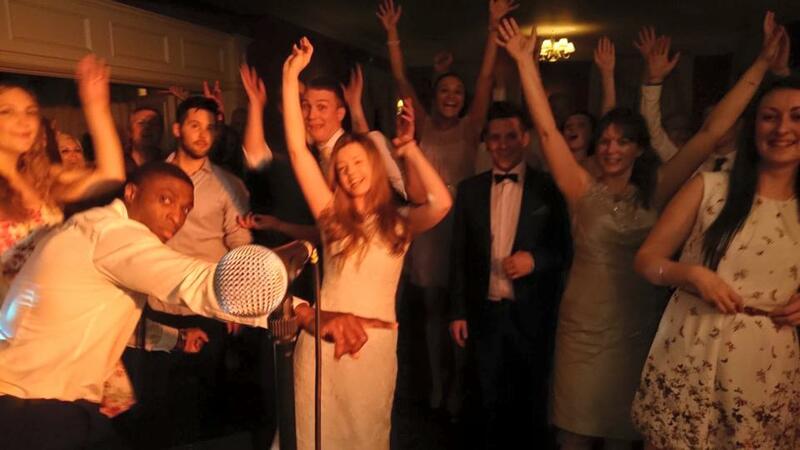 The swing band’s three sets ended in traditional style with the bride and groom circled by their friends for ‘New York, New York’ before leading two congas around the room to ‘Amarillo’. 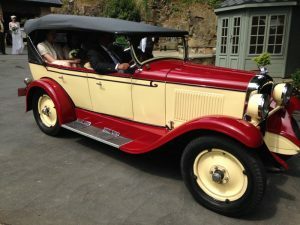 The two lines of guests were eventually led out of the venue to wave off the happy couple as they were whisked away to an unknown location in a waiting limo. 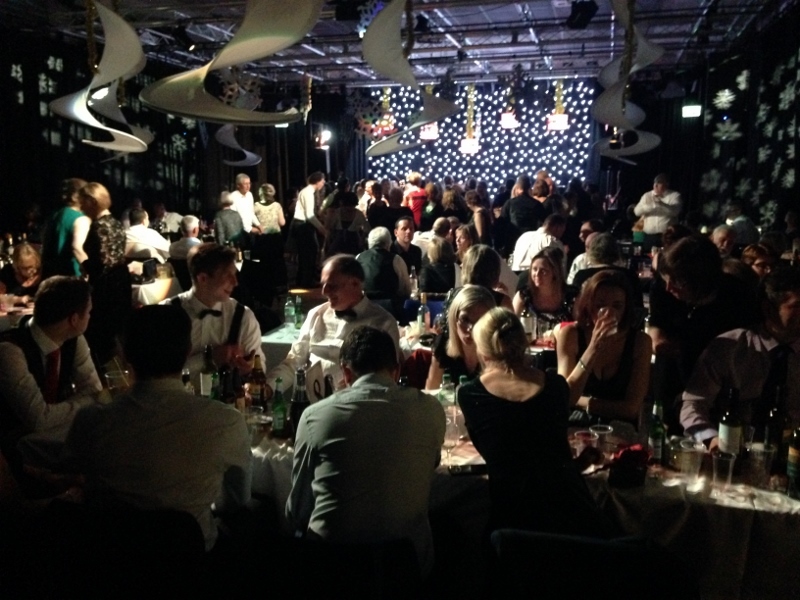 What a great night……and the new numbers went down a treat too! Having played before for York & Ainsty (South), members of Mr Swing were looking forward to an appreciative audience at the ‘Northern’ annual ball and weren’t disappointed. It was rather a late start in the end with the Harrogate swing band playing one long ninety minute set instead of the usual two. 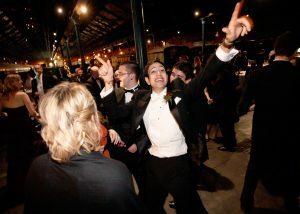 After a meal and various formalities and presentations, guests at these events are often itching to get up and dance and this was no exception. It was very noticeable that some ‘southern’ members had infiltrated the ranks when the customary chant of ‘Mr Bojangles’ was heard ringing out between numbers early on. Thanks for the support guys! With Ab Fab Disco taking the reins through ‘til 2am, the dance-floor was packed solidly for three hours. 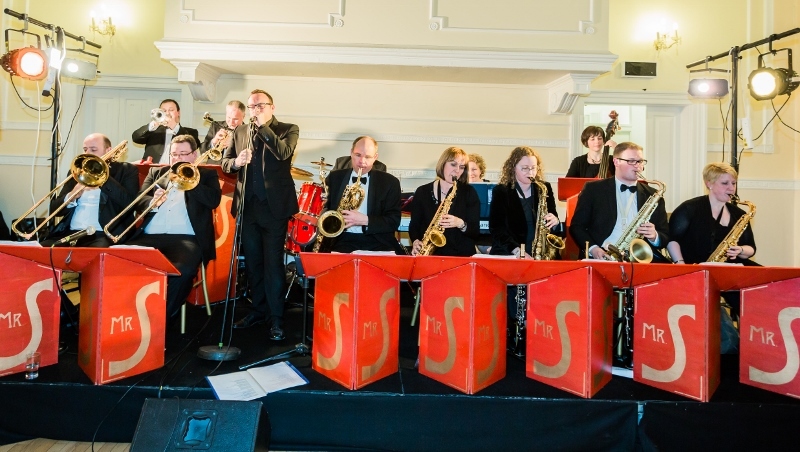 Mr Swing’s Dance Orchestra was booked to support the legendary Joe Loss Orchestra for their annual New Year visit to Bridlington Spa (a famous venue for swing bands in the North East, North West and North, South, East and West Yorkshire). An enormous venue with a huge crowd of Joe Loss fans – over 700 strong! 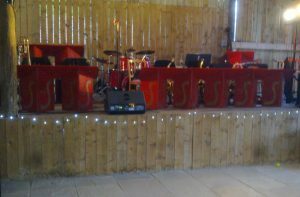 With Mr Swing’s Dance Orchestra being the largest band to play alongside Joe Loss at the event over the years, stage management was going to be of paramount importance and to this end I liaised at length with Todd Miller, leader of the Joe Loss Orchestra since Joe’s passing twenty years ago. Great fella Todd, consummate professional, and we had the changeovers down to five or ten minutes throughout the evening. Mr Swing took to the stage at 8:00pm and had the not insubstantial dance-floor full within 32 bars! After an hour of swing band and big band classics, it was very pleasing to be approached by a group of Todd’s regular followers and told we were by far the best support they’d seen on New Year’s Eve in all the many years they’d been attending. Todd and the gang then kept the floor full throughout a 90 minute set including anything and everything as Mr Swing members enjoyed themselves on the balcony with some formation tomfoolery. After two and a half hours of non-stop dancing, the audience was understandably flagging and Mr Swing’s second set was more of a concert with guests singing along, conserving their energy and refuelling ready to bring in the New Year with Todd Miller and the Joe Loss Orchestra. All in all a great evening and an event we’d love to play again.